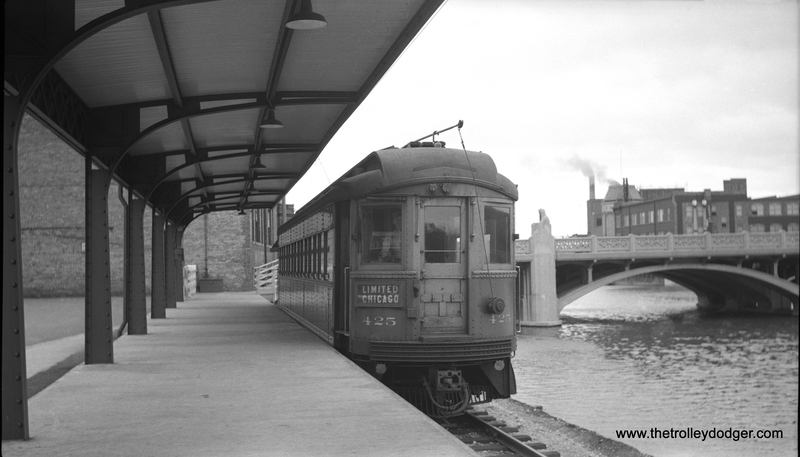 The last Chicago, North Shore & Milwaukee interurban train ran in the early hours of a very cold January 21, 1963. 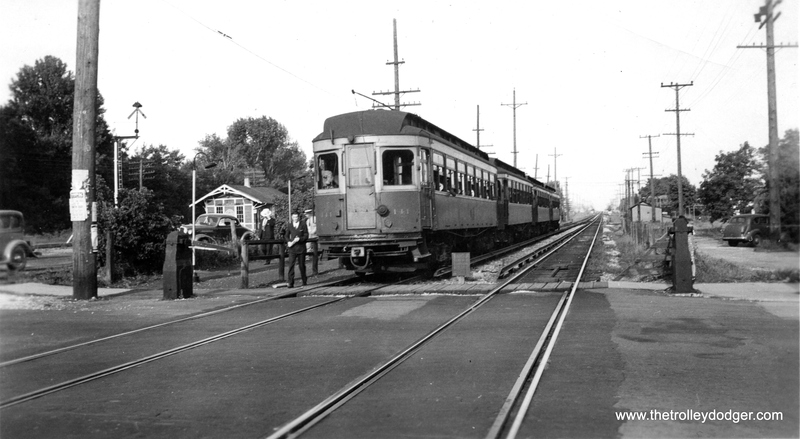 George Hilton and John Due, in their classic book The Electric Interurban Railways in America called this the end of the Interurban Era in the United States. The 54th anniversary was just a few days ago. 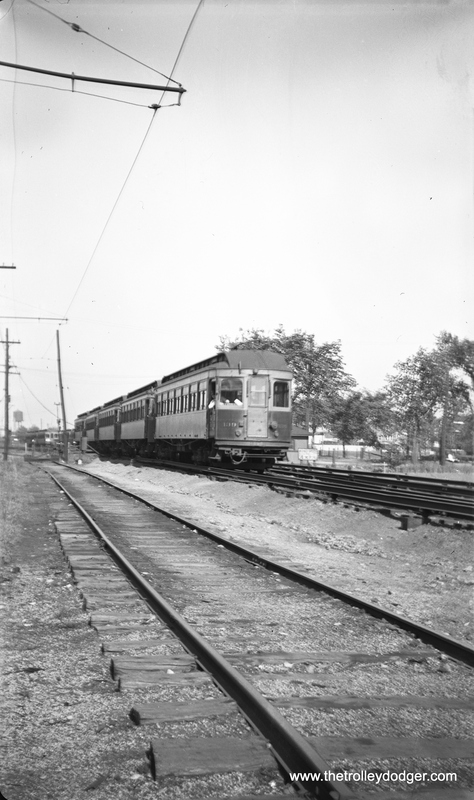 Since this was also the second anniversary of this blog, we thought this an excellent opportunity to showcase the three great Chicago-area interurbans- the North Shore Line, South Shore Line, and Chicago, Aurora & Elgin. We have been saving up images of these lines, and now find ourselves with enough for two posts. 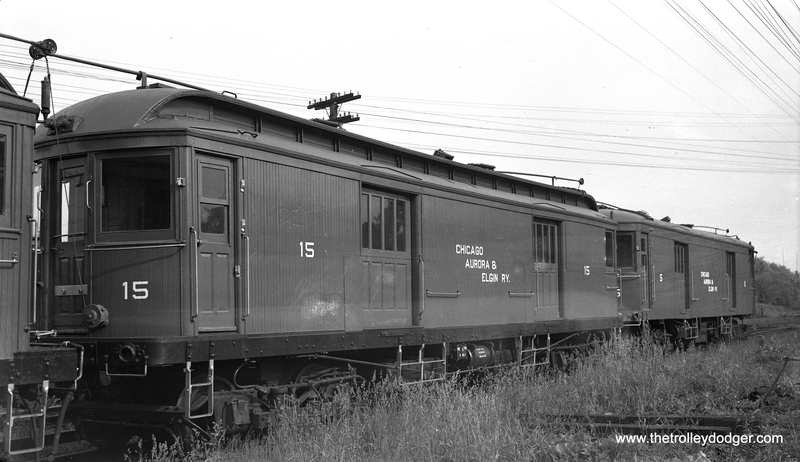 So today, we will begin with the “Roarin’ Elgin” and its one-time subsidiary, the Aurora, Elgin & Fox River Electric. The great majority of these images were scanned from the original medium-format negatives. 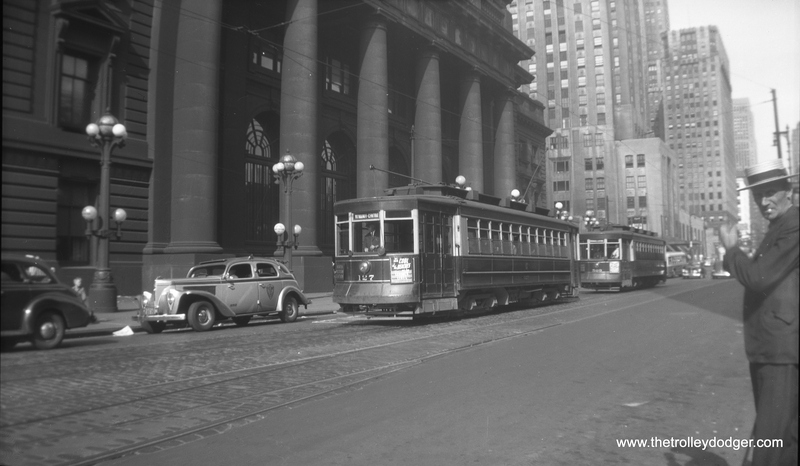 While we do lament the passing of the Interurban Era and two of the three major Chicago systems, we can celebrate them with these classic pictures. Some of these were made possible thanks to your recent generous donations. 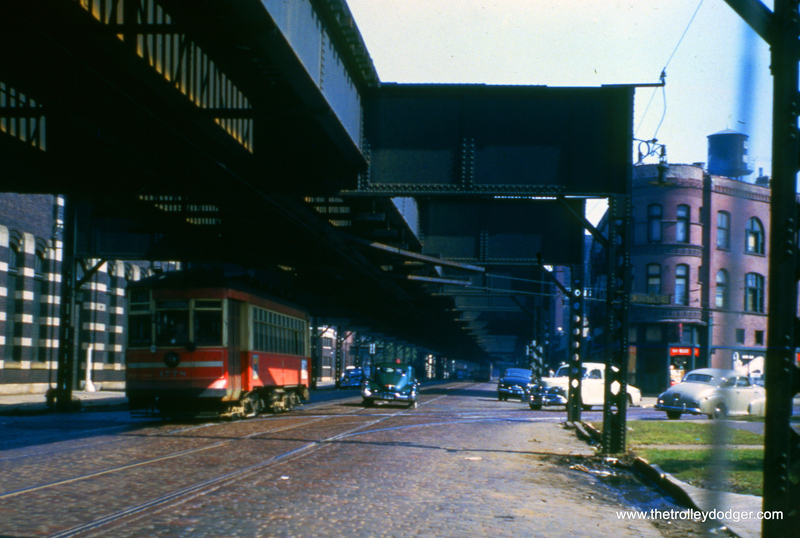 We will round out January in a few days with our second installment of great Chicago interurbans, featuring the North Shore Line and South Shore Line. Watch this space! While visiting a friend at Rush hospital earlier this month, I took a few pictures from out the window. 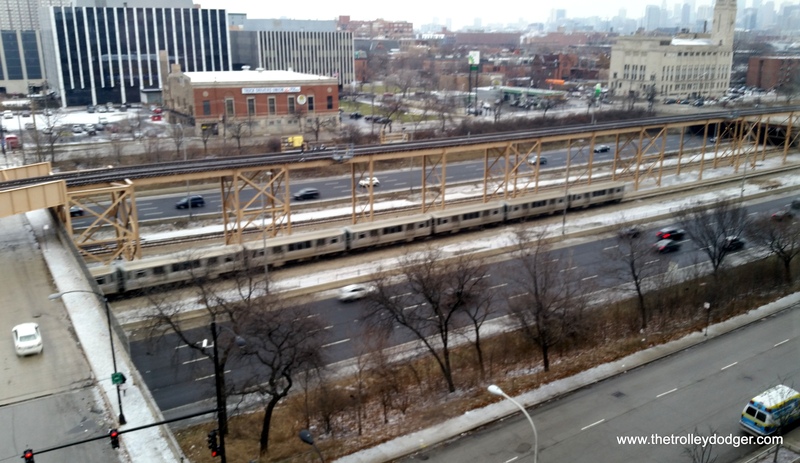 It just so happened his room had a spectacular view of where the Chicago Transit Authority’s Pink Line crosses over the Blue Line. 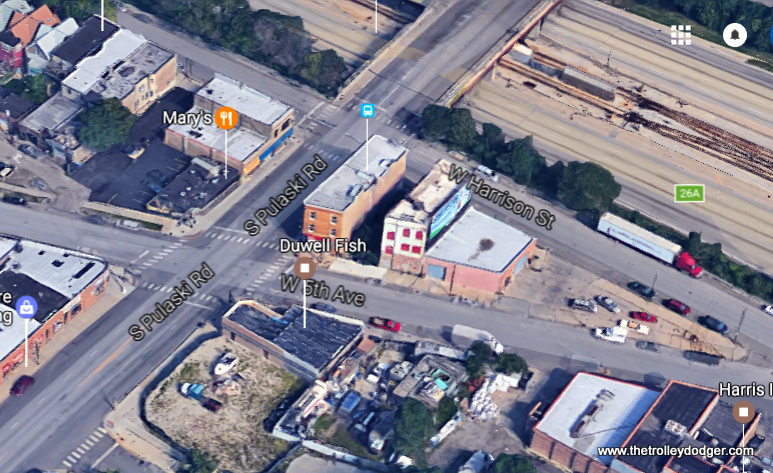 There is a ramp at this location, which is also where the old Marshfied Junction was on the Met “L”. 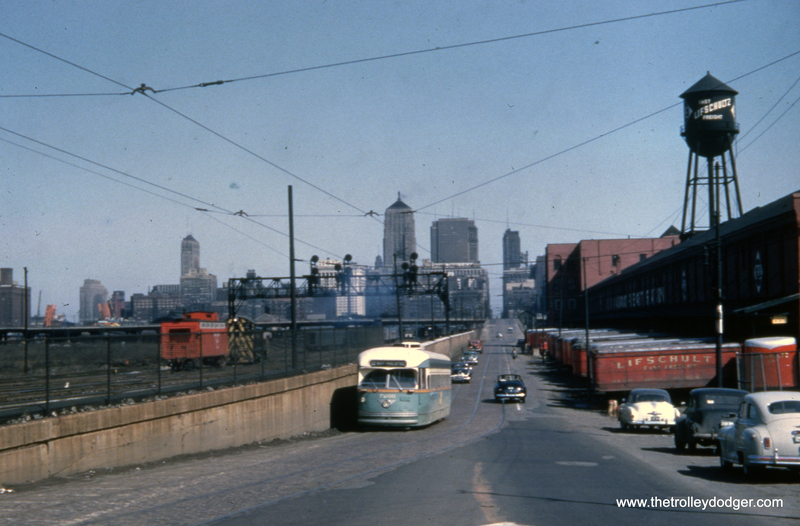 In previous posts, we have run pictures showing how this looked like before expressway construction in the early 1950s. 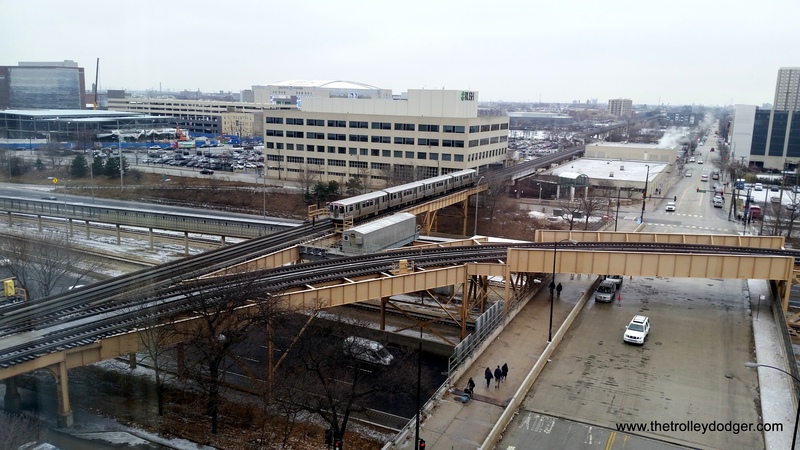 An inbound Blue Line train passes the point where part of an access ramp at the Damen-Ogden-Paulina station was damaged during a lightning storm. With the addition of chain-link fencing, it has since been reopened. A southbound Pink Line train about to cross over the Blue Line. An inbound Blue Line train. 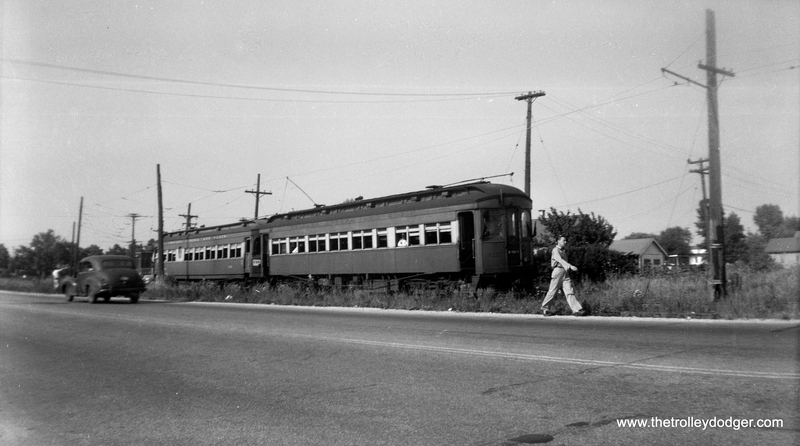 A northbound Pink Line train has just passed the location of the old Marshfield Junction on the Met “L”. 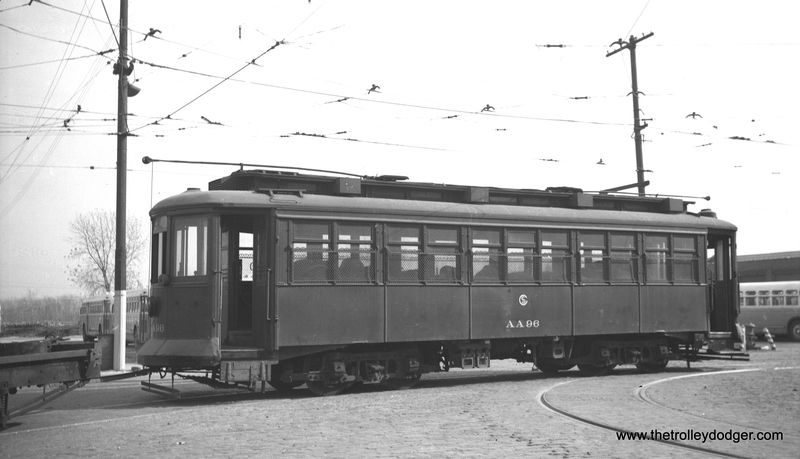 This is a rare photo, as it shows AE&FRE car 304 sometime prior to the abandonment of passenger service in 1935. 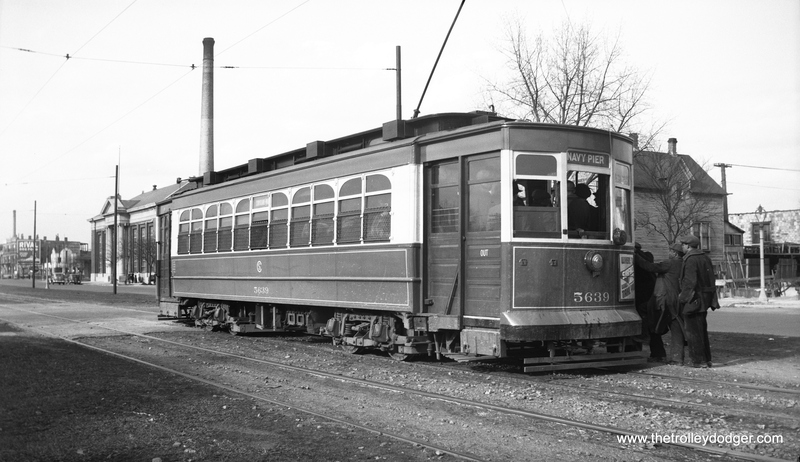 Don’s Rail Photos: “304 was built by St Louis Car in 1924. #1306. 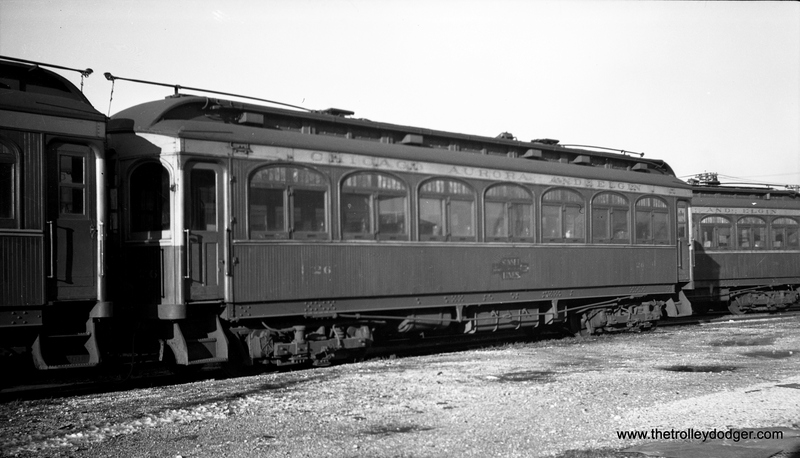 In 1936 it was sold CI/SHRT (aka Shaker Heights Rapid Transit) as 304 and in 1954 it was sold to CP&SW (Trolleyville USA) as 304. 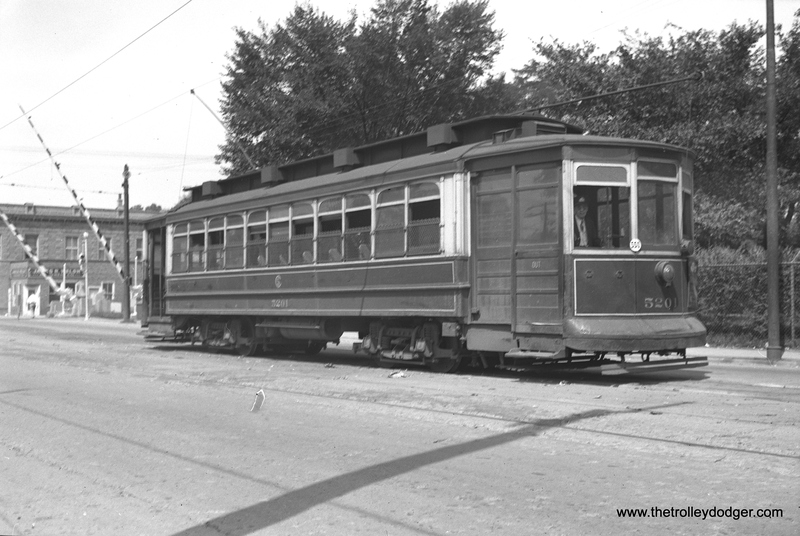 It was sold to Fox River Trolley Museum in 2009.” I have had the pleasure of riding on this fine car at the Fox River Trolley Museum, as it has returned to its home rais after a 75-year absence. You can see pictures I took of it there on the previous blog that I worked on here. Long may it run. 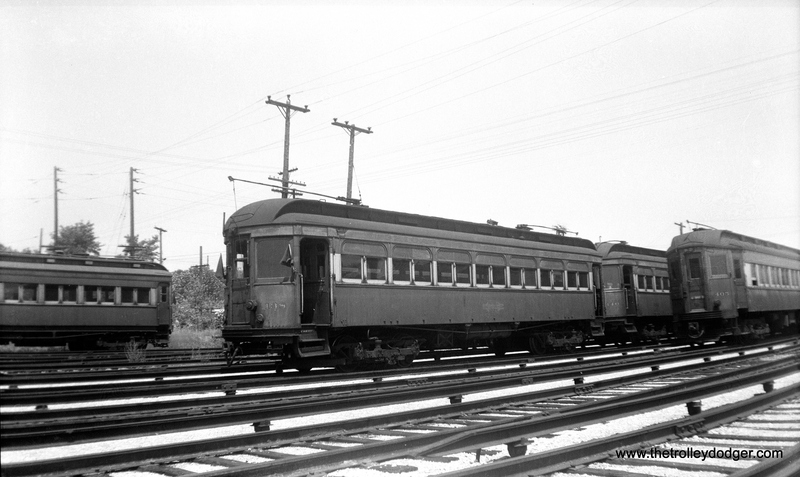 CA&E wood car 138 at the Wheaton Yard on July 3, 1949. 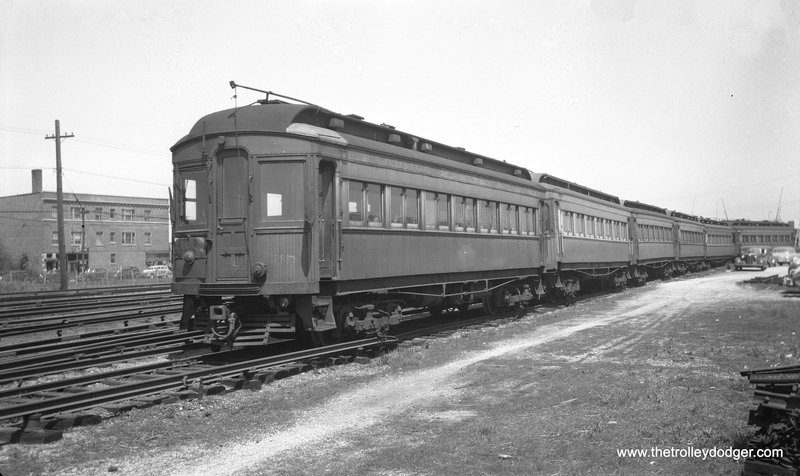 Don’s Rail Photos says, “138 was built by American Car Co in March 1910, #844, as C&ME 138. 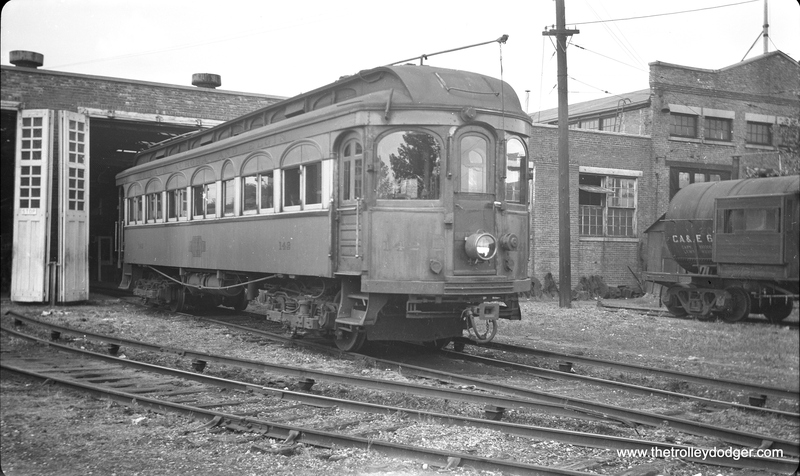 It was rebuilt in 1914 and no retired date.” This was one of several cars leased from the North Shore Line in 1936 and purchased from them a decade later. Ironically, this made them the last passenger cars bought by CA&E. 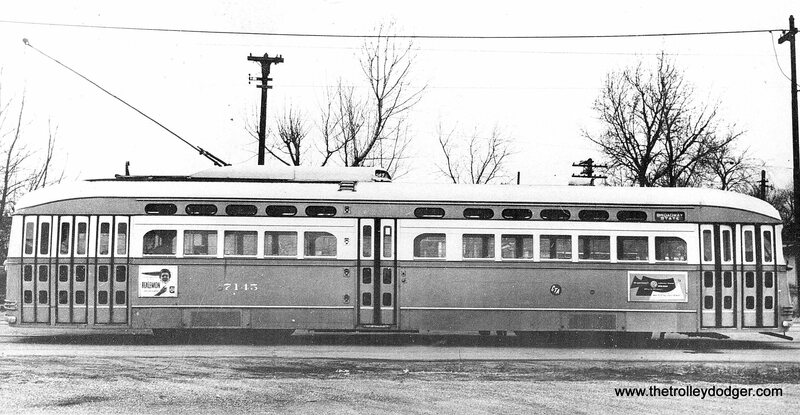 They were considered surplus after service was cut back to Forest Park in 1953 and were scrapped shortly thereafter. 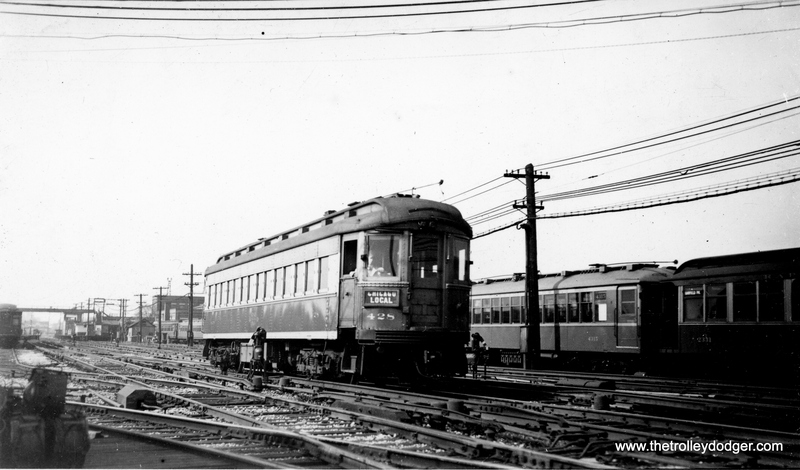 CA&E 458 at Wheaton on June 18, 1947. 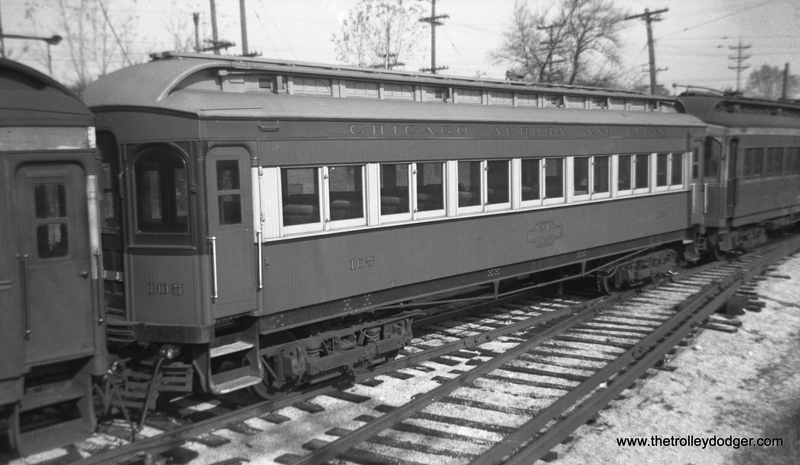 This was part of an order of 10 curved-sided cars built in 1945 by St. Louis Car Company. 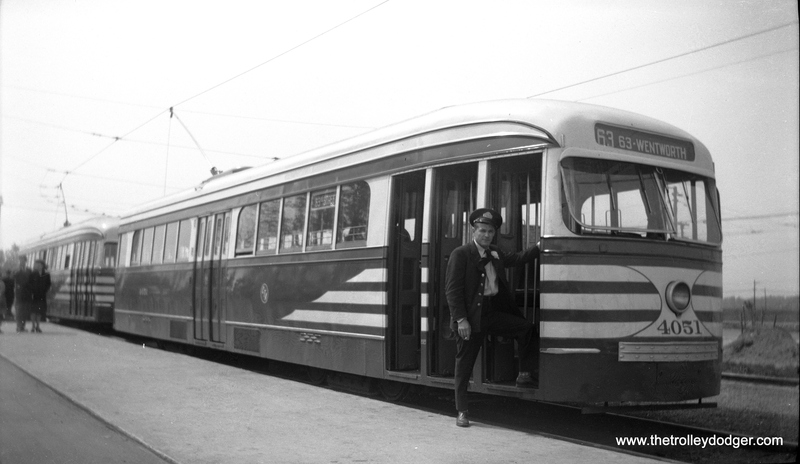 Some consider these the last standard interurban cars built. 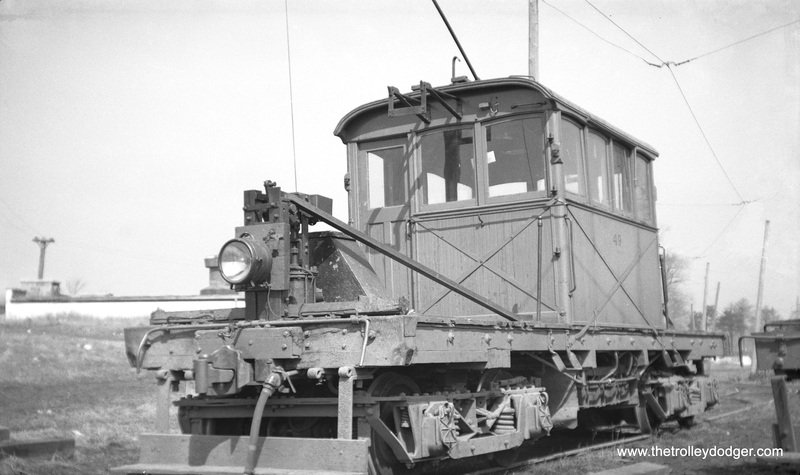 Don’s Rail Photos: “11 was built by Brill in 1910, #16483. 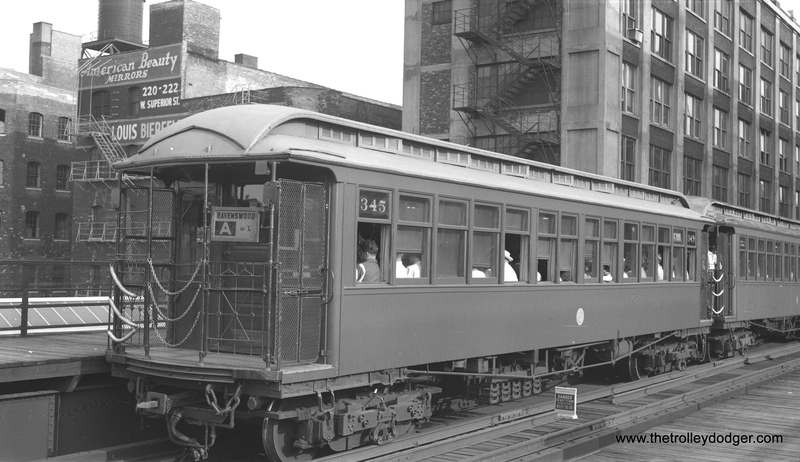 It was rebuilt to a line car in 1947 and replaced 45. 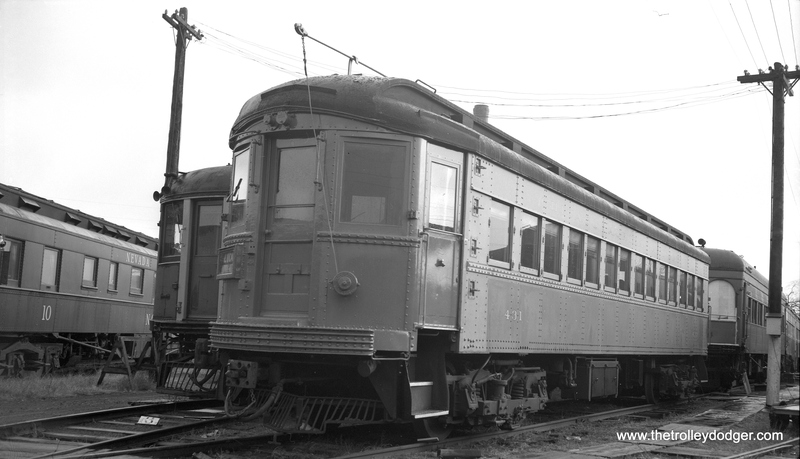 It was acquired by Railway Equipment Leasing & Invenstment Co in 1962 and became Fox River Trolley Museum in 1984. 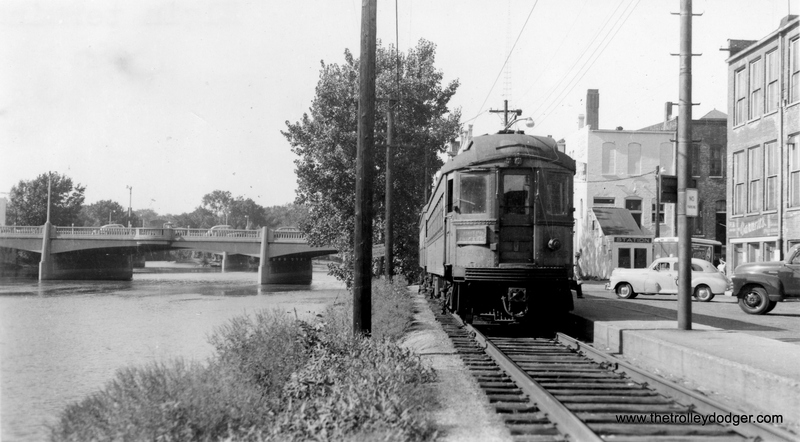 It was lettered as Fox River & Eastern.” Here we see it at Wheaton in July 1948. In the days before scanners, fans tried to document things as best they could. 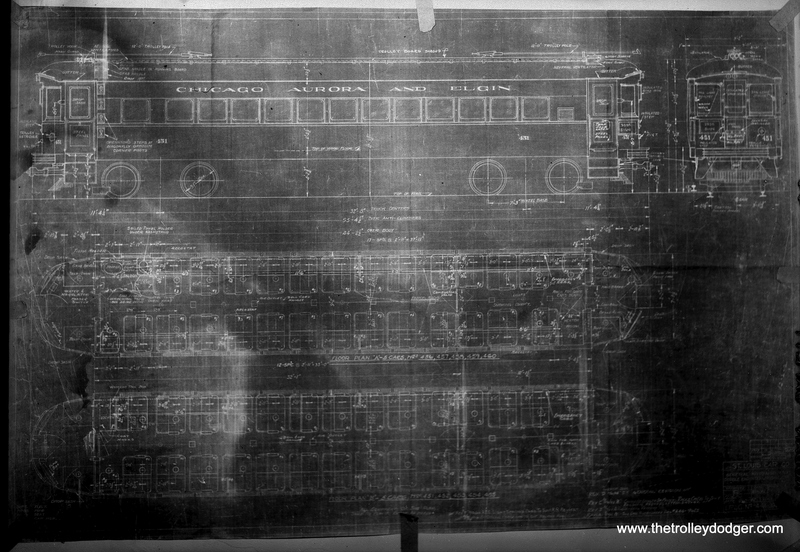 Here is a not-so-successful attempt to photograph the blueprint for car 451 in August 1949. 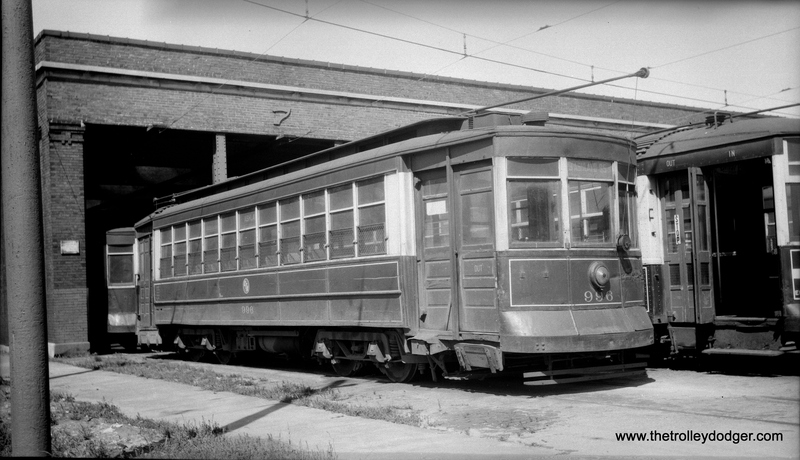 Don’s Rai Photos: “9 was built by Niles Car in 1907. 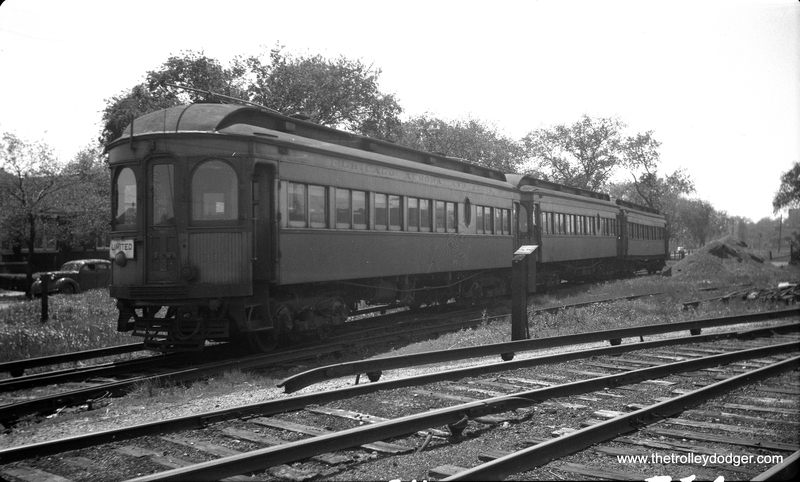 It was scrapped in 1959.” This picture was taken at Wheaton in April 1952. 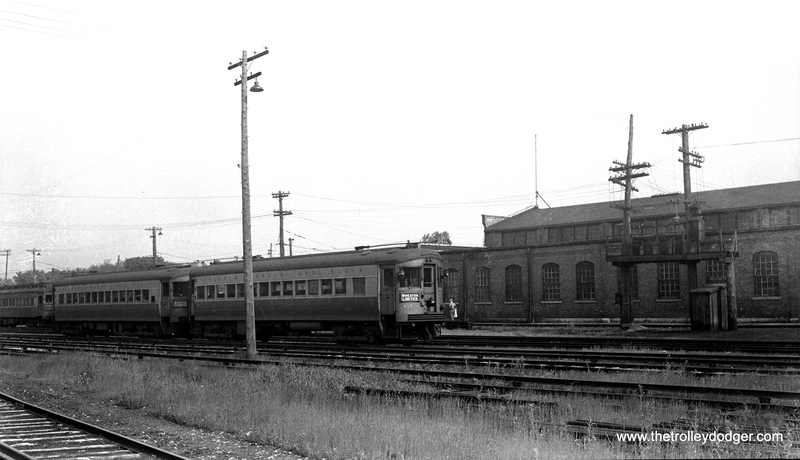 Here is 425 at the Aurora terminal in October 1949. 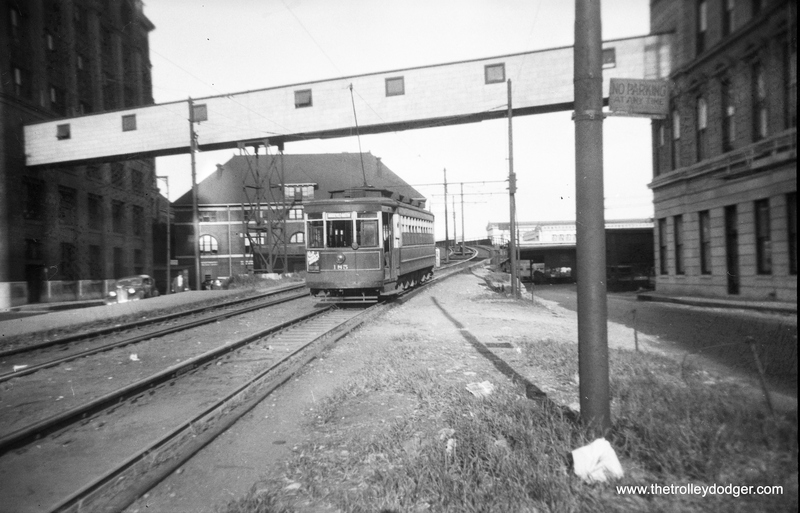 While the CA&E used third rail extensively, the Aurora and Elgin terminals had overhead wire. 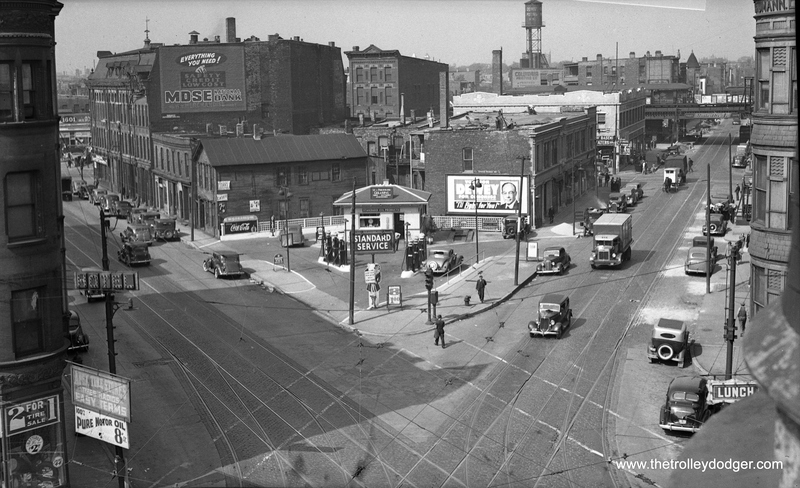 This terminal replaced street running in downtown Aurora in the late 1930s. 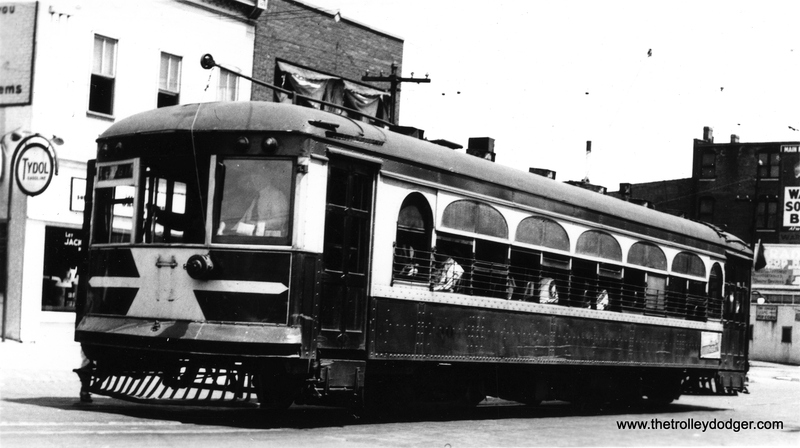 The 425 was built by Cincinnati Car Co. in 1927. CA&E 139 heads up a five-car train of woods in the maroon and cream paint scheme. I don’t know where this was taken. There is a siding with overhead wire, so perhaps that is a clue towards figuring it out. The water tower in the background may indicate that we are somewhere west of Laramie. Randall Hicks: “I believe the picture of 139 and train was taken facing north at Childs St. crossover. The train is pulling south off the west ladder. There was a short team track there under wire. And that is indeed somewhere west of Laramie. 🙂” Yes, Wheaton is indeed west of Laramie, thanks. The approximate location of the previous photo is 5413 W. Flournoy, on Chicago’s west side. 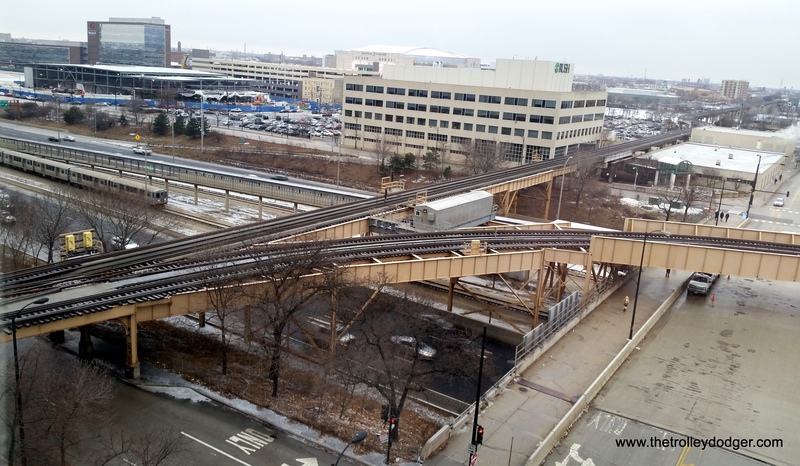 The area once occupied by the CA&E’s storage tracks is now part of the Eisenhower expressway footprint. 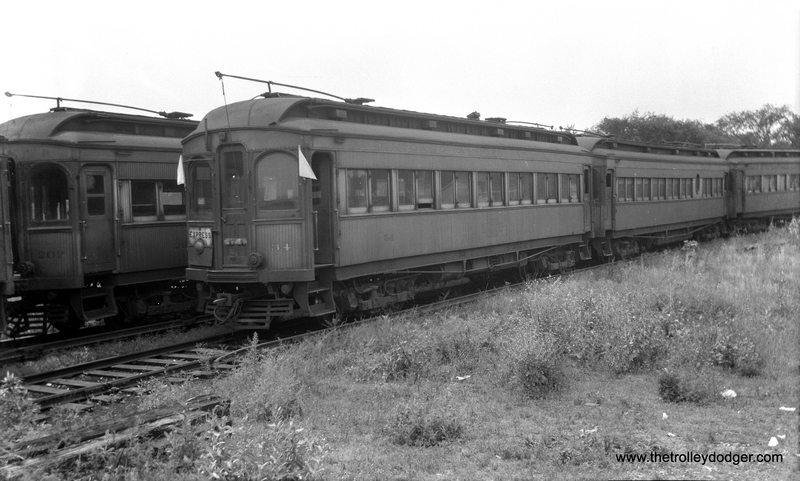 A two-car train of 300-series woods on a July 8, 1949 fantrip. From the “side of the road” location under wire, I would guess this is the Mt. Carmel branch along Mannheim Road. 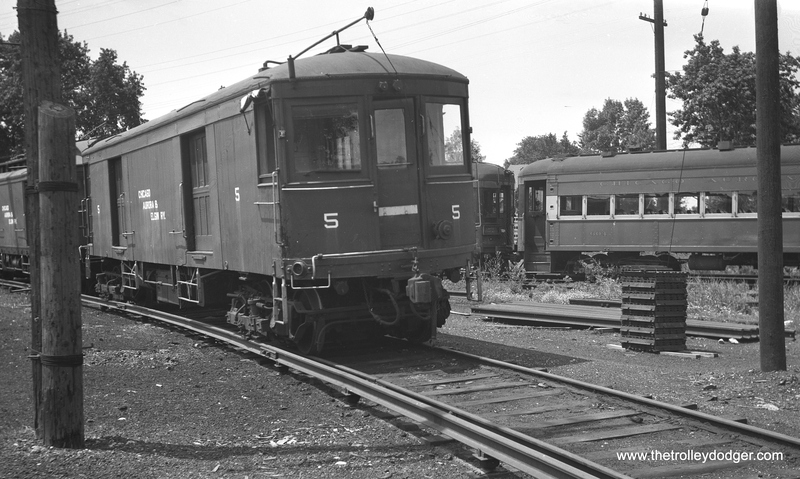 CA&E 5 at Wheaton Yards in July 1948. 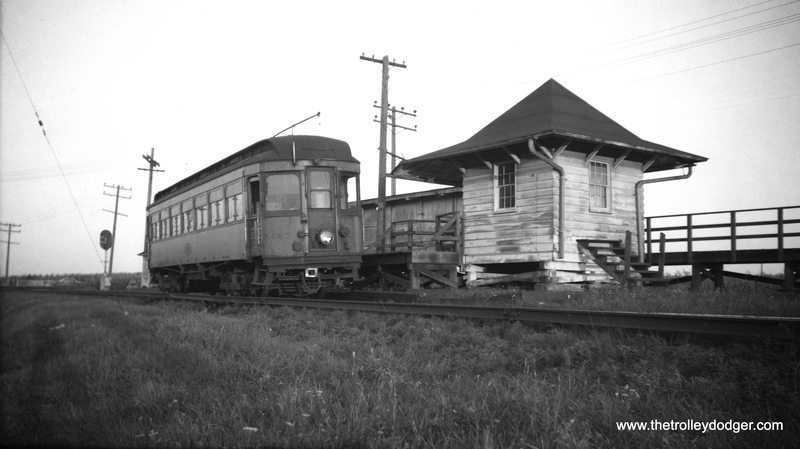 CA&E 141 on single-track private right-of-way at Batavia Junction on August 13, 1952. 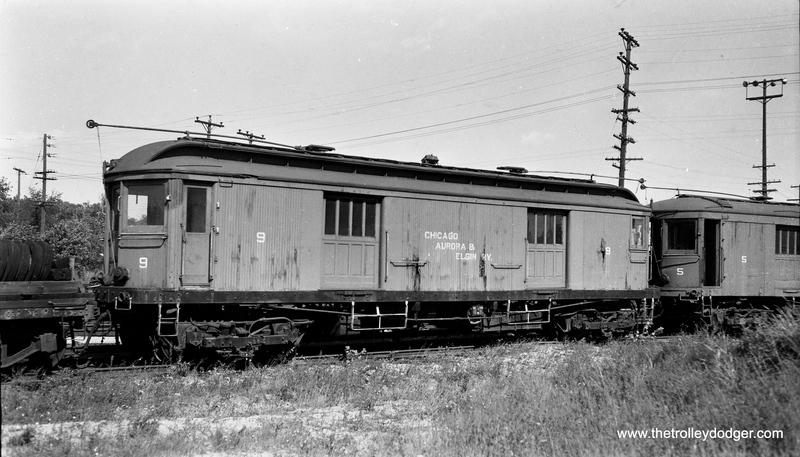 This was one of several woods that CA&E bought from the North Shore Line in 1946, after the latter decided it no longer wanted to run wood cars in passenger service. CA&E ran wood cars right up until the end of service. 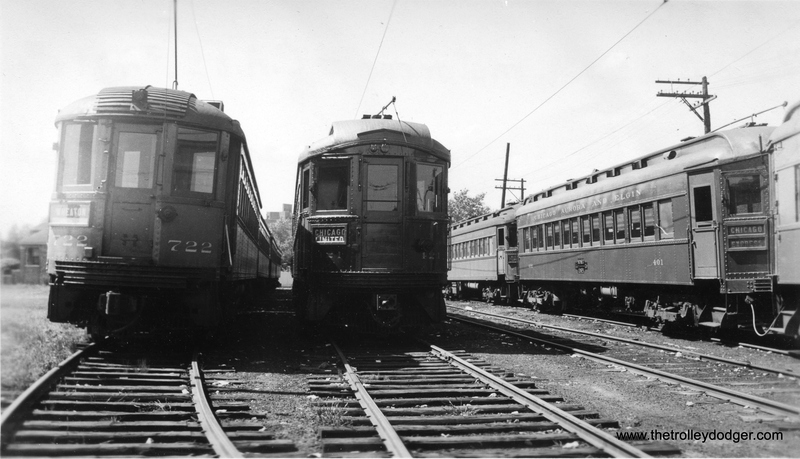 CA&E 142 at Wheaton in July 1948. 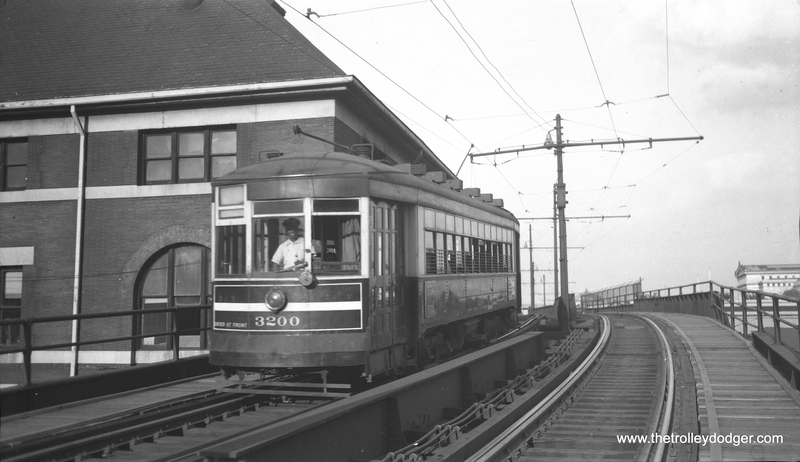 Some of these cars were used on the North Shore Line as late as 1946. We wrote about that on the previous blog we worked on. Check out the post A Mystery Solved (August 6, 2013) for more details. AE&FRE loco 23. The caption gives the location as Aurora, but this may be in error. 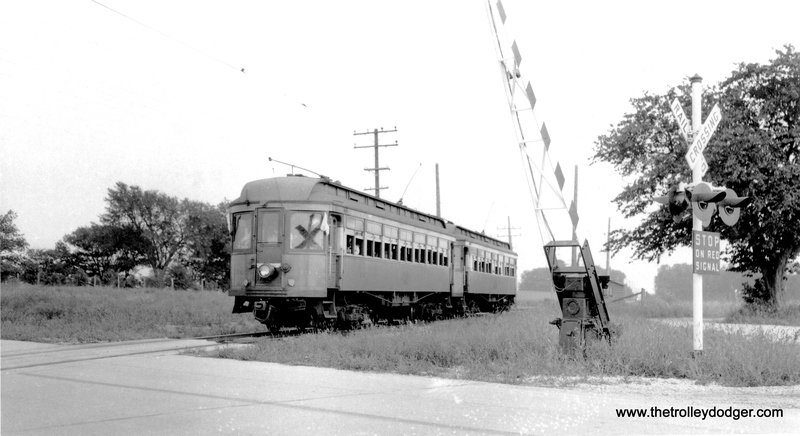 After passenger service ended in 1935, this line was reduced to three miles of track in the South Elgin area– the current site of the Fox River Trolley Museum. 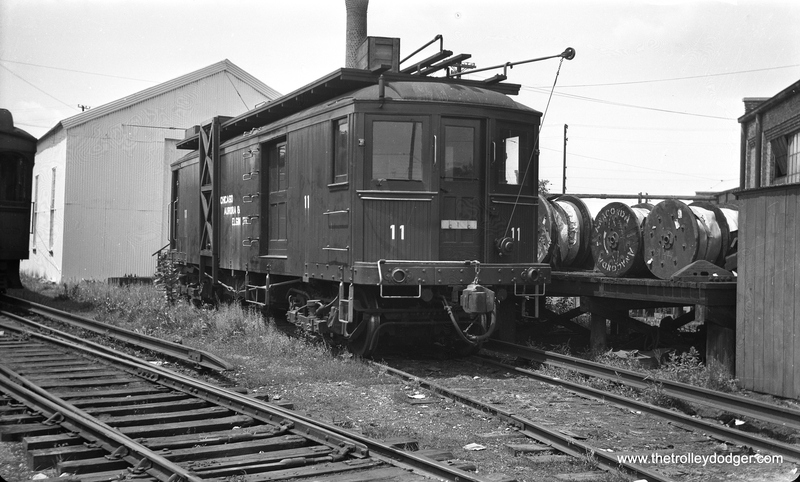 Electric locos ran unti 1947, and the last freight move took place in 1972. 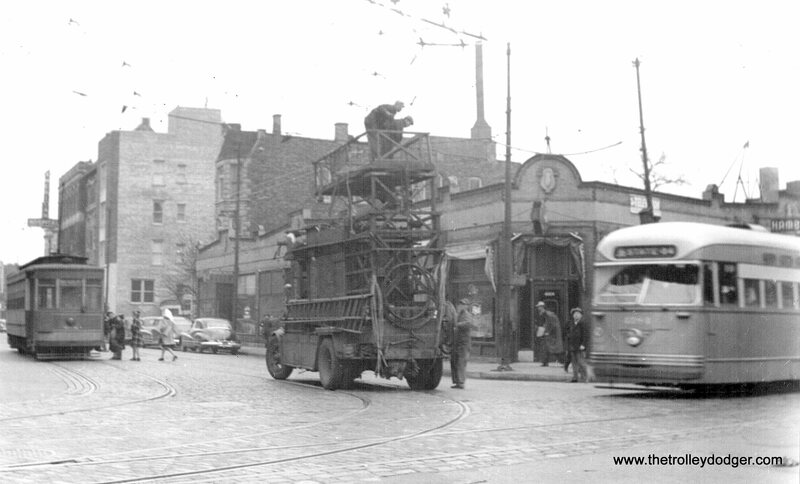 Around 1940, there were a couple of fantrips. 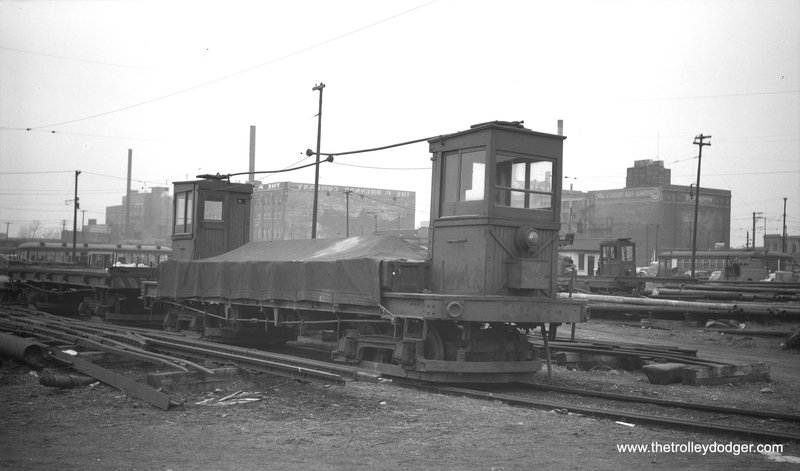 AE&FRE electric freight loco 49 in Elgin in November 1939. This was one of two that the railroad had in it latter days. AE&FRE loco 49. The neg envelope says this is Aurora, but it is much more likely to be Elgin. 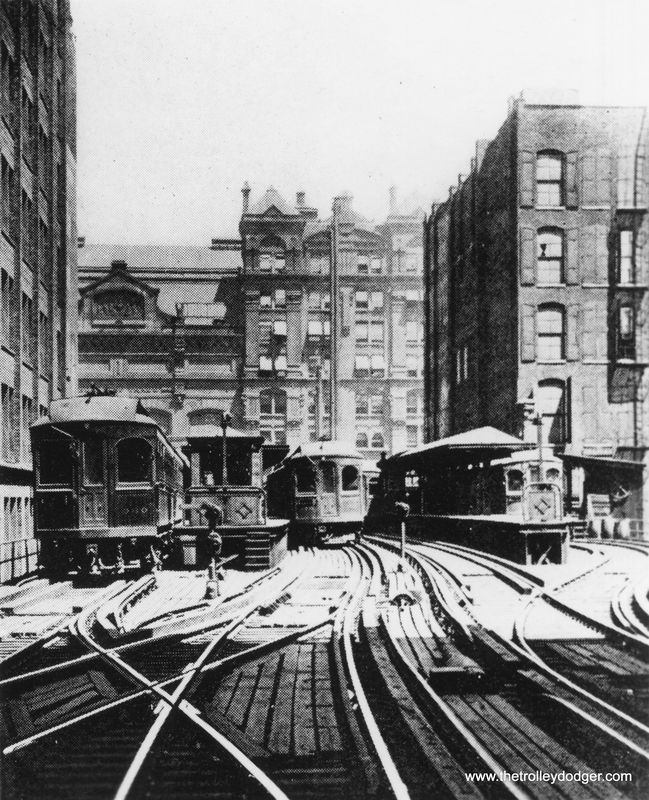 This is a well-known photo showing the Wells Street Terminal, where CA&E cars ended up in downtown Chicago starting in 1905. 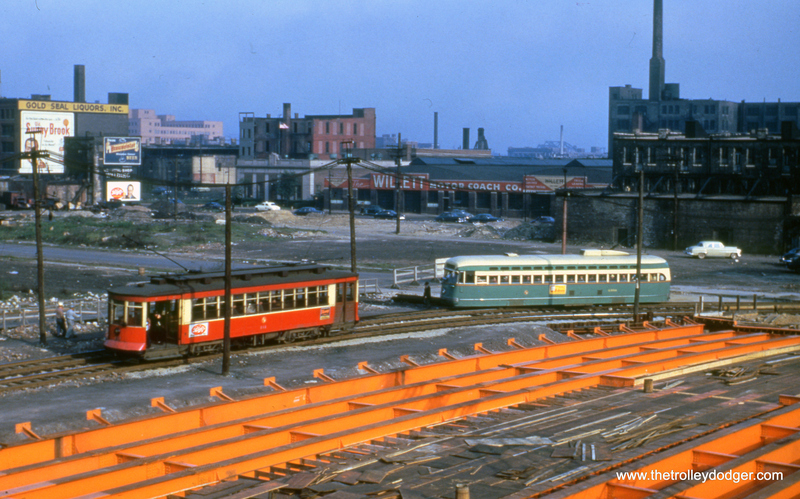 CA&E trains did not go around the Loop, although this terminal was adjacent to it. There is some question as to whether all CA&E cars could actually make the Loop’s tight clearances. To the best of my knowledge, some could and perhaps others could not. CA&E 426 at the Elgin terminal. Although this was the “Great Third Rail,” overhead wire was used here. The CA&E’s Aurora terminal, after it was moved here in the late 1930s. 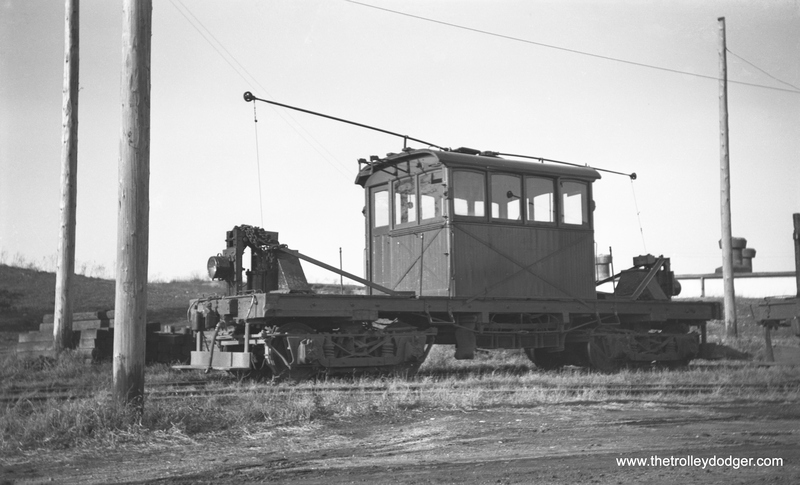 A 6-car train of CA&E woods near Laramie Avenue on May 7, 1937. 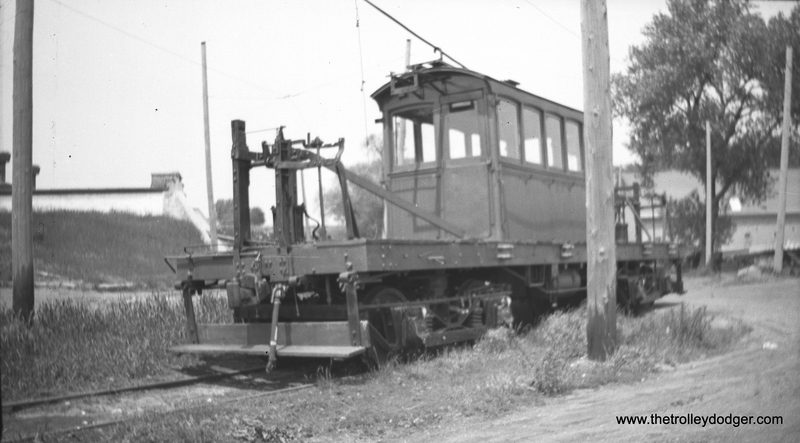 CA&E 134 and 137 under wire at State Road crossing on the Batavia branch, August 30, 1942. The flags would seem to indicate this was CERA fantrip #39. Wire was used here for a short distance instead of third rail, due to the width of the crossing. I’d like to ask you a question about some historical research I’ve been doing about my hometown, Mystic, CT. I’ve got a very old postcard (1907) that features two trolleys and a utility pole with several black and white diagonal stripes at its base on our main street, just a few hundred feet away from our bascule drawbridge (it can be seen here on the left utility pole http://www.groton-ct.gov/history/detail.asp?bibid=1079). At first, I wondered if this signaled a trolley stop, but I know from researching other postcards from my area in that time period that a trolley stop was designated by a thick band of white (several feet thick) painted onto the utility pole, usually several feet up from the ground. Then I wondered if it could be some sort of safety alert with “black and white stripes” placed several hundred feet before a drawbridge, like the one Boston instituted after a trolley of theirs crashed into the river while the drawbridge was open, killing 47 people (https://www.bostonglobe.com/metro/2016/10/29/trolleydisaster/c451CX1qx9SpPo5tJAupFP/story.html). However, the original report from Boston’s Public Safety Commission in 1917 said that the black and white striped alert should be on a mechanized gate. 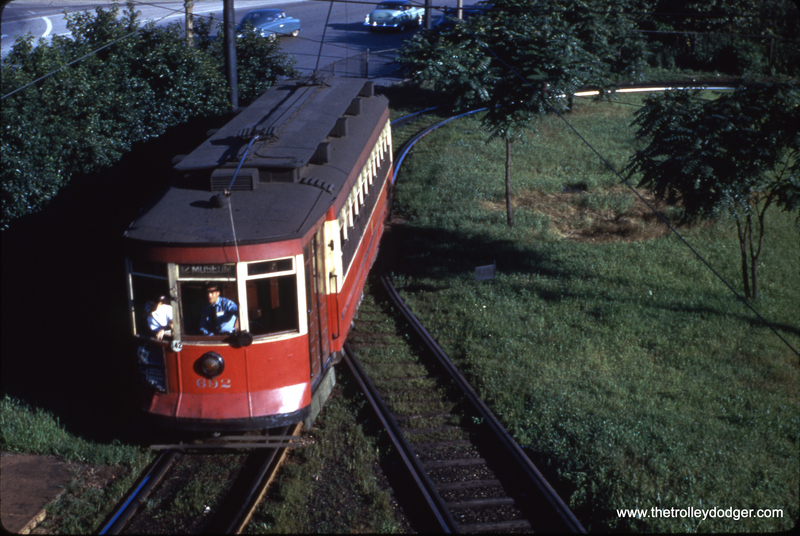 Do you have any clue if this is related to trolleys at all? I would greatly appreciate your help with this!! I will put it in my next post, thanks. Got any pictures I can use? Yes! 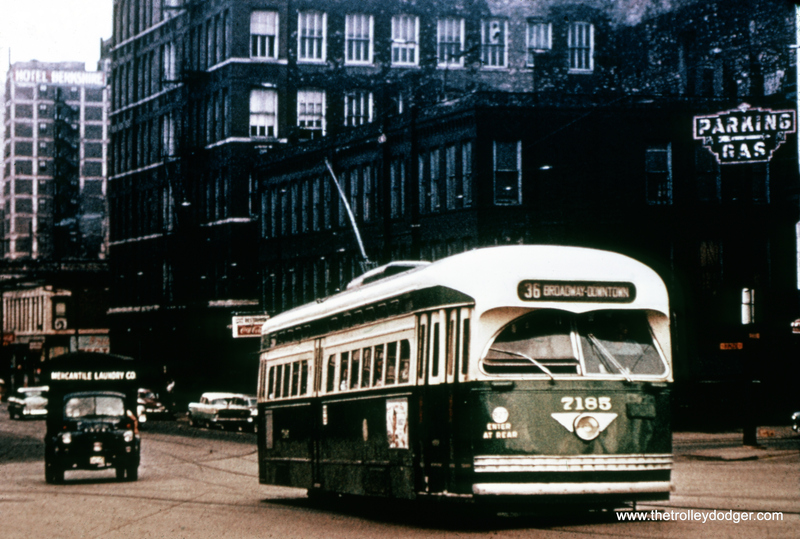 Here is the picture of the trolleys on our main street. The striped utility pole is shown to the left. 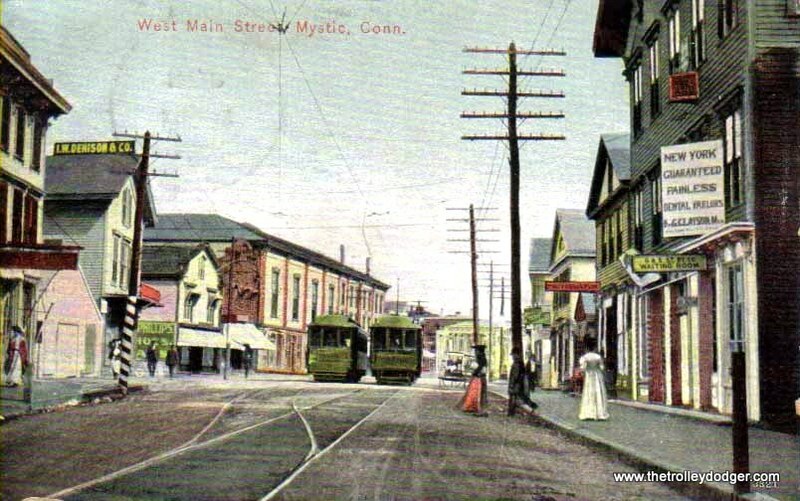 Trolleys first began running in Mystic in 1905, and this postcard is dated 1907. I have also included a picture of a woman waiting by a trolley stop- which looks very different from the striped pole seen in the postcard. If you need any more pictures, let me know! Perhaps one of our readers may know, thanks. A few years ago, I had the pleasure of spending an evening in Mystic, CT and even ate at Mystic Pizza, which was made famous by a film of the same name. This is our 174th post, and we are gradually creating a body of work and an online resource for the benefit of all railfans, everywhere. To date, we have received over 244,000 page views, for which we are very grateful. 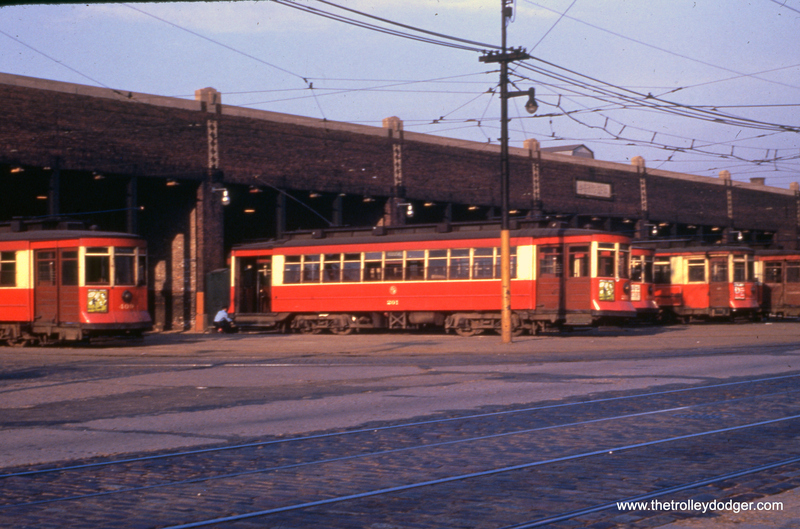 As we mentioned in a previous post, we are on a tight deadline to finish our new book Chicago Trolleys. Your financial contributions will help make this book better, and are greatly appreciated. Here, we see one-man CTA 3150(?) 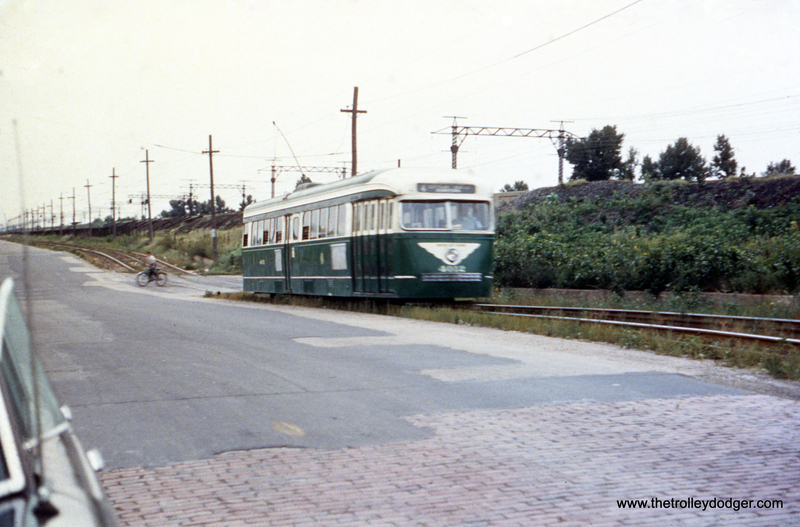 and its operator at the east end of route 21 on Cermak and Prairie Avenue in June 1951. Prairie Avenue was also the location of the local Kodak processing plant, which handled Kodachrome until the early 1980s. “One good turn deserves another.” Or at least, that is how the saying goes. We started this blog on January 21, 2015, so this post (our 173rd) is the last one for our full second year. When we started, we had no clue what the reaction would be. But, we had to believe that some good would come from sharing our transit photos and information with you. Our experience from the past two years has shown this very much to be the case. As we have shared our information, others have come forward to share theirs with us. We have reached an audience, and our continued growth demonstrates that railfan interest is growing, not shrinking. Now, we are being contacted by more and more researchers, who are using us as a resource for their own work. Another word that comes to mind is “sustainability.” I don’t consider this a commercial site, since everything here is free for all to enjoy. But it does take both time and resources to keep providing you with a steady stream of high-quality images. We are happy to put in the time, but resources are always limited. As a general rule, for each image you see here, it probably costs us $10 to bring that to you. That is the average cost of a print, negative, or slide, including the shipping. Some images cost more, some less. When you have as many as 40 or 50 high-quality images in a single post, you can see how that can add up in a real hurry. Every little bit we can raise helps. Often there is one and only one opportunity to purchase these images. Collections come to market, often when the original photographer or collector has unfortunately died, and their images are sold off one at a time and scattered to the four winds. If you see something unique, and pass on the opportunity to acquire it, you may never see it again. Such are opportunities are fleeting. So there has always been a gap between the images that we get to share with you, and the ones that we could if we only had the resources. Our goal is to make this gap as small as possible. Luckily, some people have shared images with us, and we appreciate it. But as much as we may try, soliciting donations and offering items for sale in our Online Store, this blog still runs a substantial deficit. 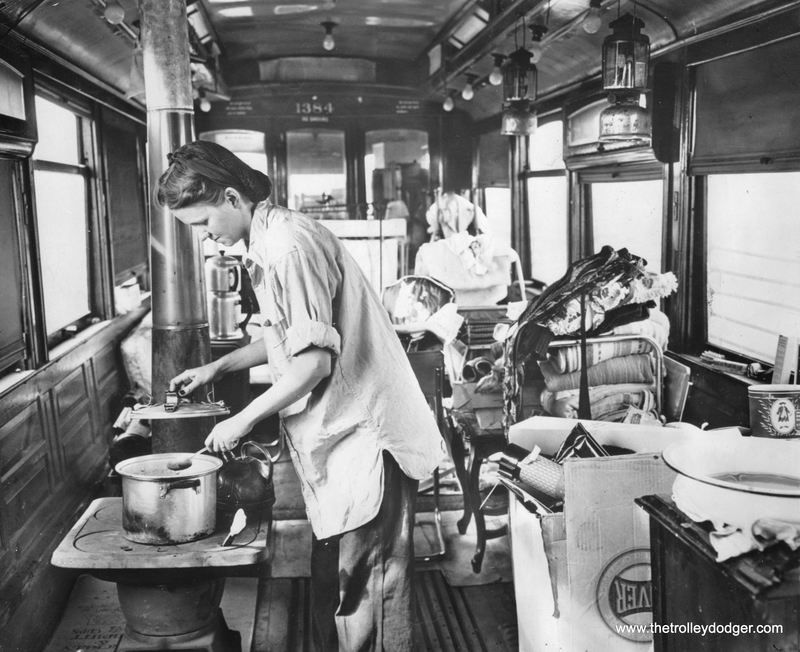 Now, it may come to pass that this will always be so, but it is our goal to make The Trolley Dodger a “sustainable” enterprise, for now and the future. That will give us the best chance to keep it going. We are encouraged by the response to our last post, where we asked for donations to help pay our domain registration and web site upkeep costs for the coming year. We received more than enough money for the costs that come due on February 3rd. So we will be here for another year, and thank everyone who so generously contributed. We used the additional funds we received to pay for some of the images you see in today’s post. 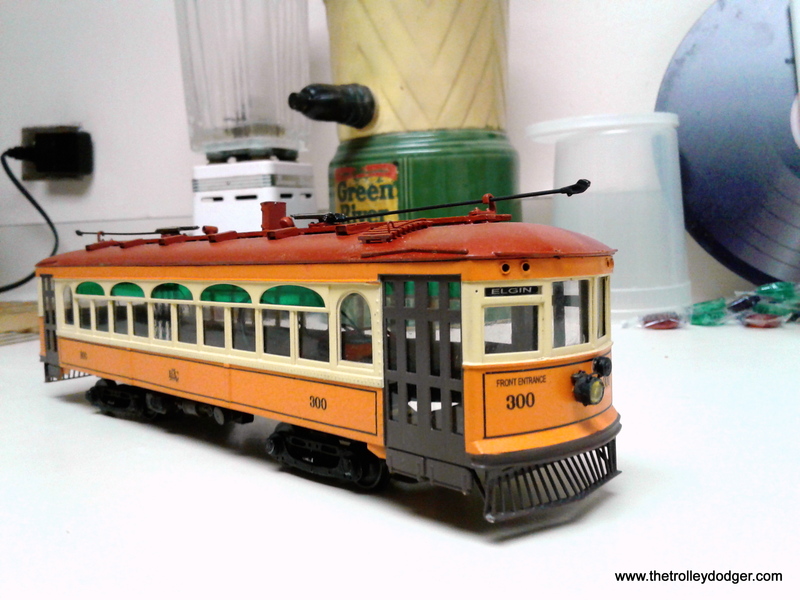 Meanwhile, we are quickly coming up on the deadline to finish our new book Chicago Trolleys. This will be our own modest contribution to the slim shelf of books about Chicago’s once-great streetcar system. Some fantastic images have come up for sale recently, which would make tremendous additions to the book. Once finished, chances are it won’t get revised or updated again for a long time. We want this book, which will include about 215 classic back-and-white pictures, to be the best that it can be. With the help of your donations and purchases, we can make this dream a reality. 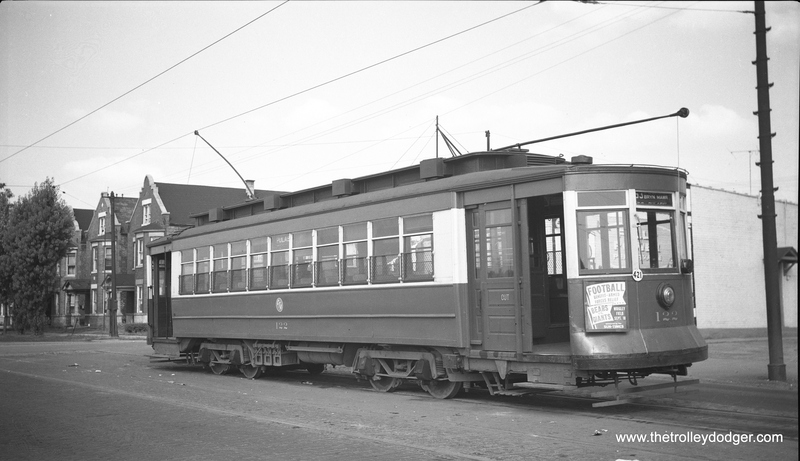 Chicago Trolleys is expected to be published later this year. We will keep you posted on our progress. PS- Our next post, the first for our third year, will feature all three great Chicago interurbans. Watch this space. 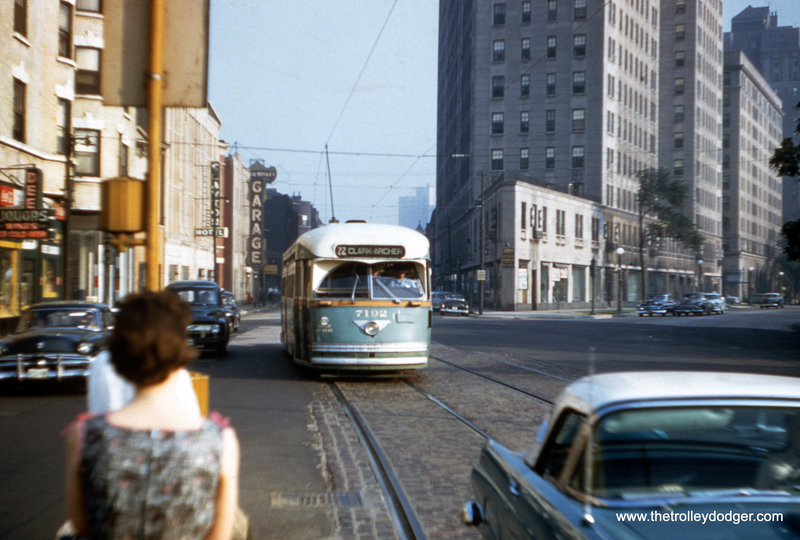 The “Broadway Downtown” sign on this car, and the appearance of the autos in the background, would probably indicate that this picture was taken circa 1956. 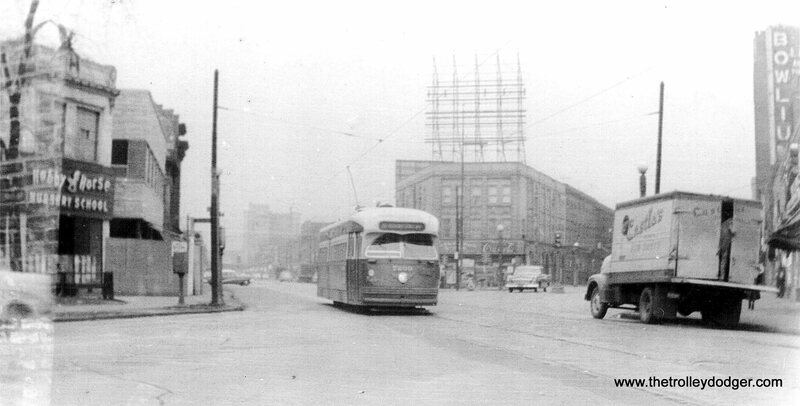 The south portion of the route 36 Broadway-State Through Route was bussed on December 3, 1955, and the remaining half on February 16, 1957. 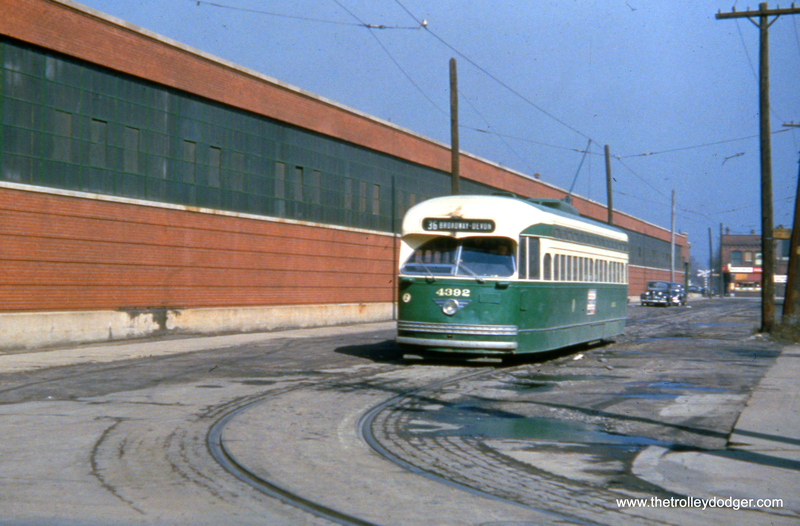 CTA one-man car 1760 on Cermak at the CB&Q (Burlington) tracks on March 21, 1954. 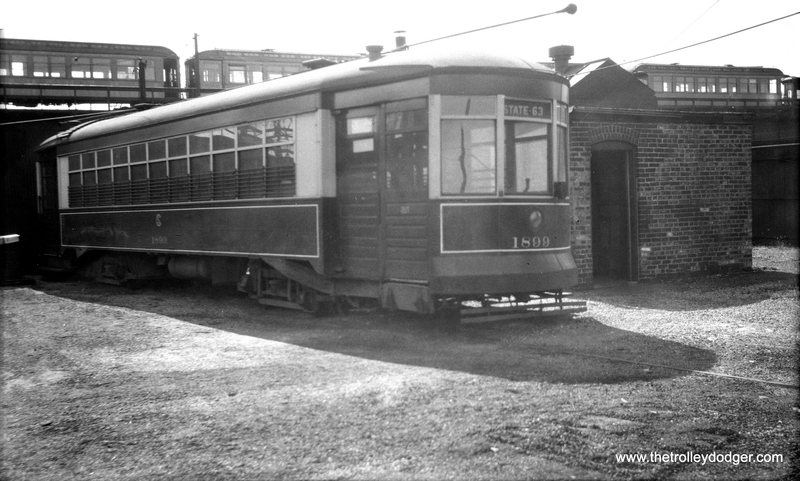 CTA 6141 at Navy Pier in June 1951. 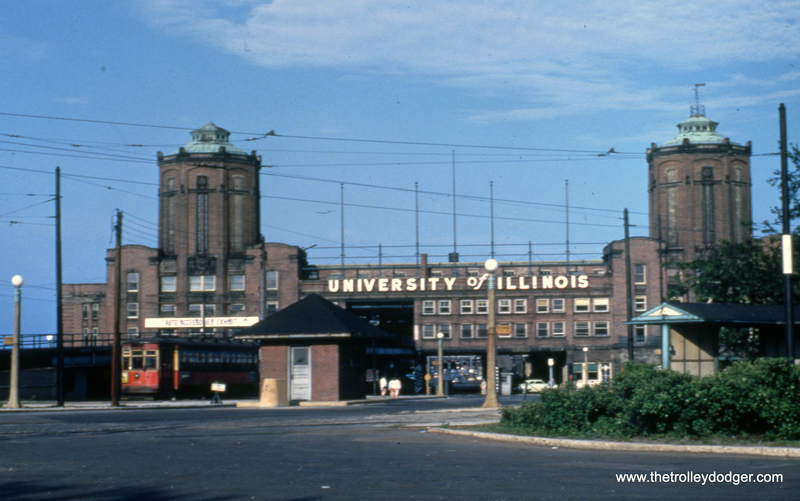 This was the location of the University of Illinois Chicago campus until it moved to its present home about 15 years later. 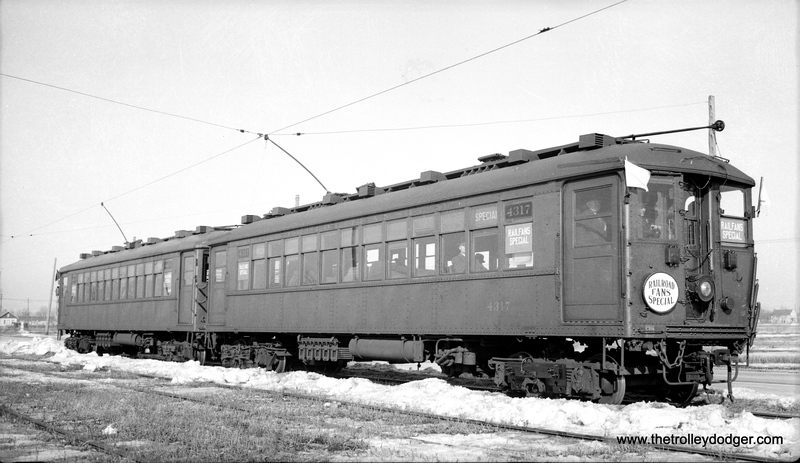 CTA 6177 at Cermak and Clark in March 1950 on route 21. 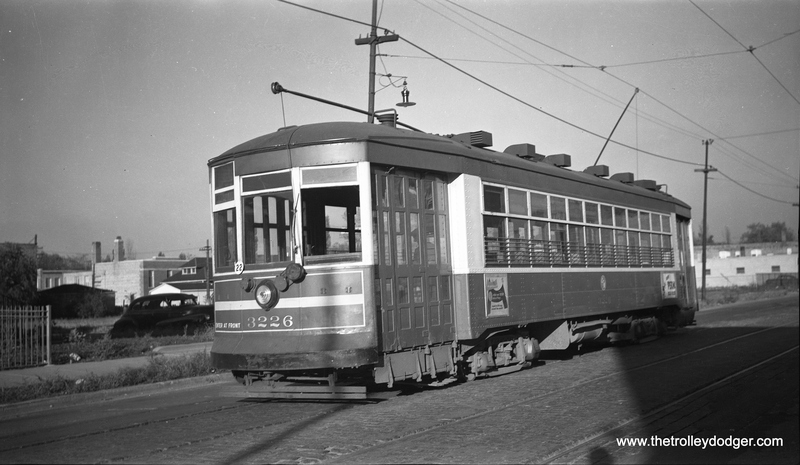 CTA 3178 on Cermak in April 1950. We sometimes get a late snow like this here in Chicago. The billboard advertises “squint-free, strain free” Hoffman TVs. 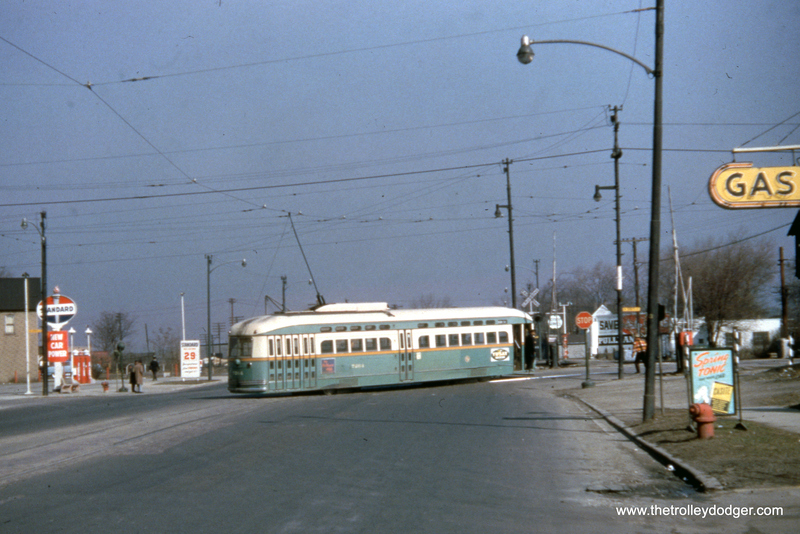 CTA 4084 at 81st and Wallace on March 24, 1954 on route 22. 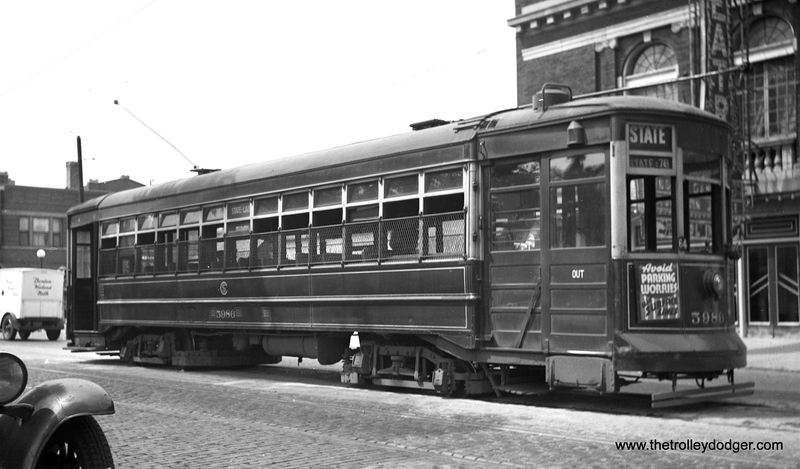 By this time, Pullman PCCs were fast disappearing as they were scrapped for parts recycling into new rapid transit cars. There is a picture of another car at this location on page 233 of CERA Bulletin 146. 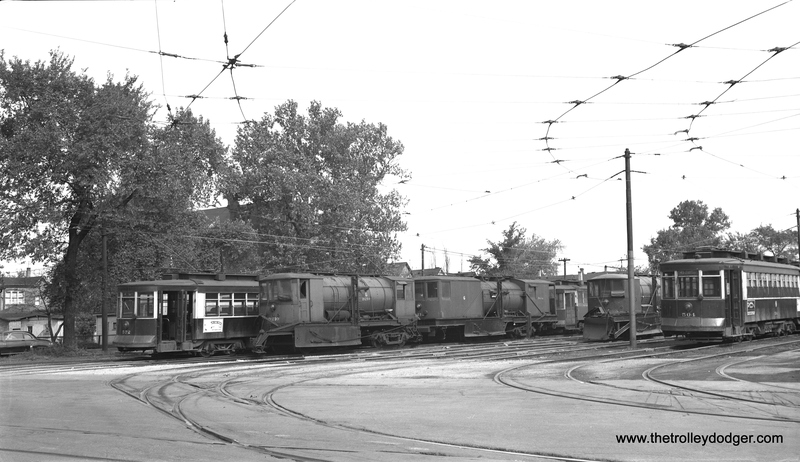 CTA 4063 at Cermak and Clark on April 11, 1954. There was a jog on route 22, where cars went between Clark and Wentworth. 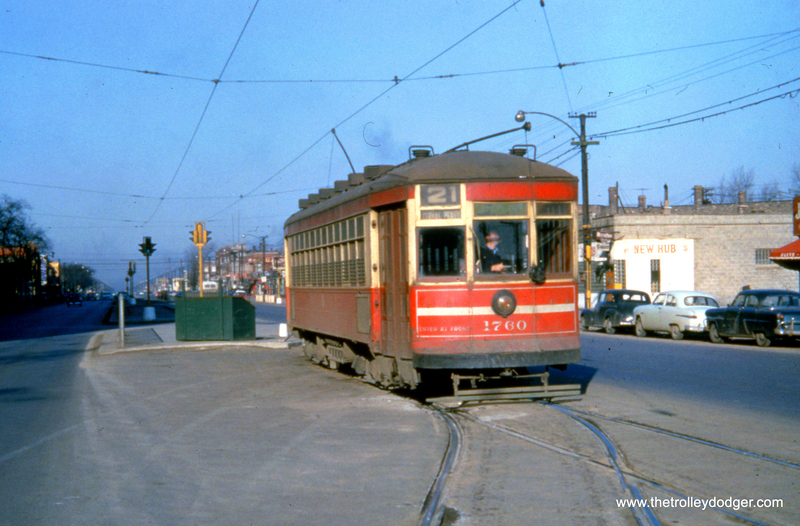 CTA 7266 on Clark at around 15th on April 11, 1954, about ready to go under the St. Charles Air Line. 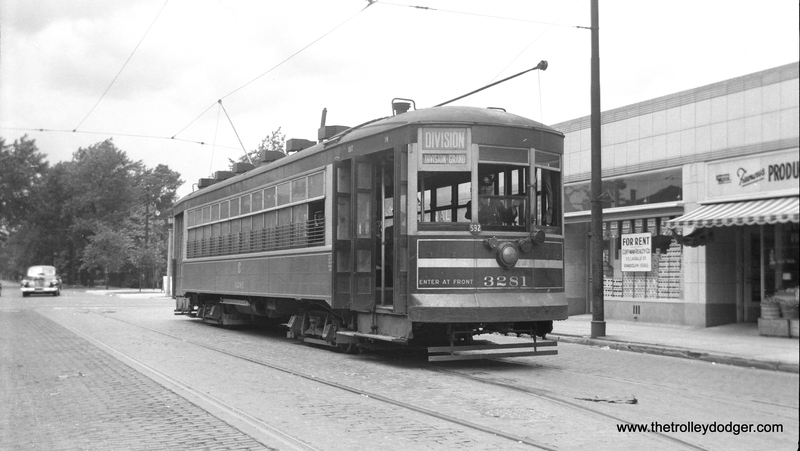 CTA 692 at the Museum Loop in May 1950. 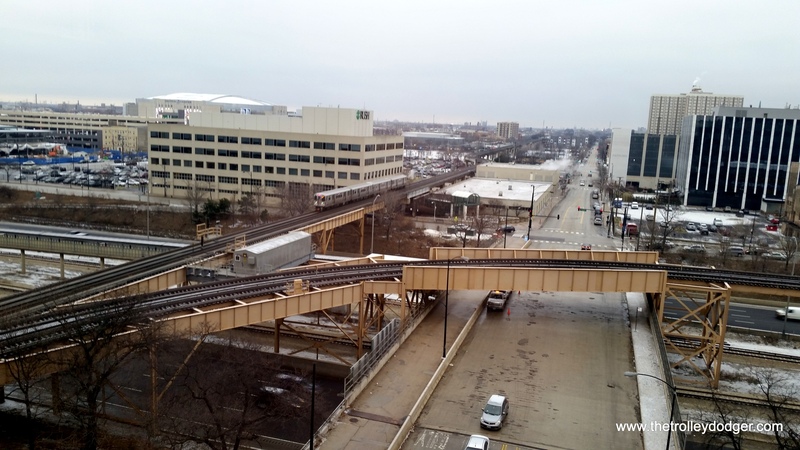 This extension of the Roosevelt Road line was built for the 1933-34 Chicago World’s Fair (A Century of Progress). 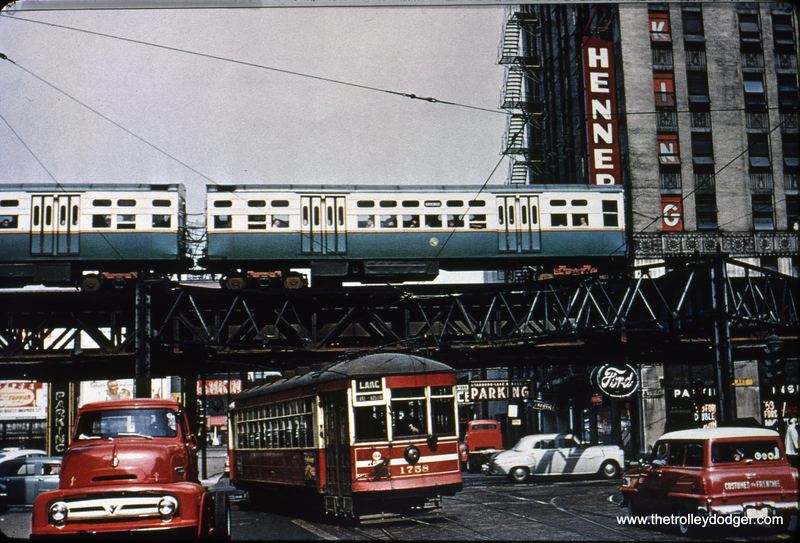 CTA 1758, at the east end of route 16, has just turned from Lake onto Dearborn circa 1953, while a train of 6000s roars overhead. 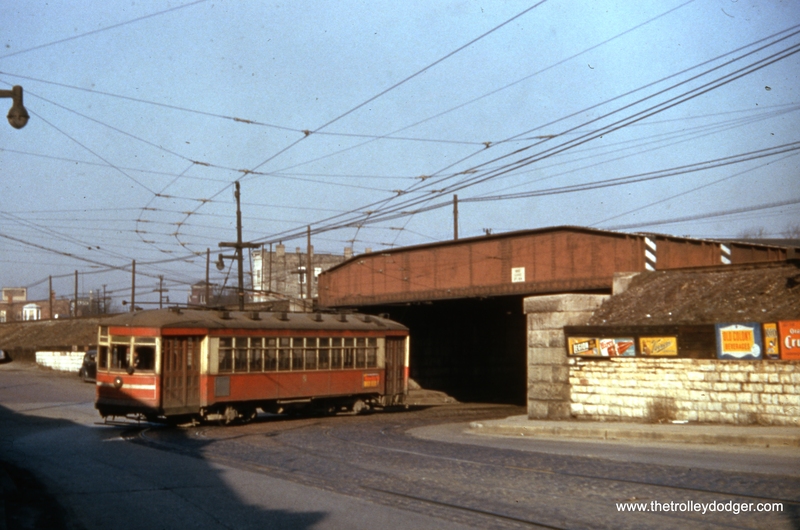 Circa 1952, a CTA red Pullman passes a Pullman PCC on temporary trackage at Halsted and Congress, during expressway construction. CTA 225 is on Roosevelt near State in Apri1 1951. 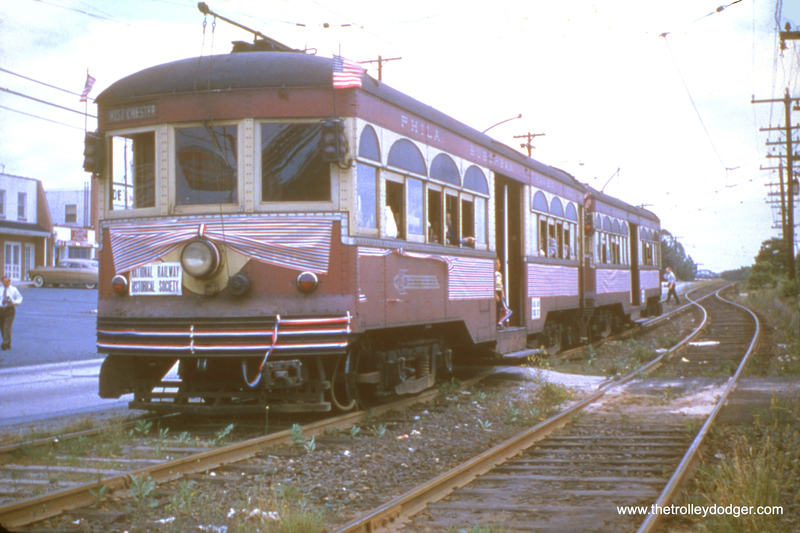 This car is now preserved at the Seashore Trolley Museum in Maine. 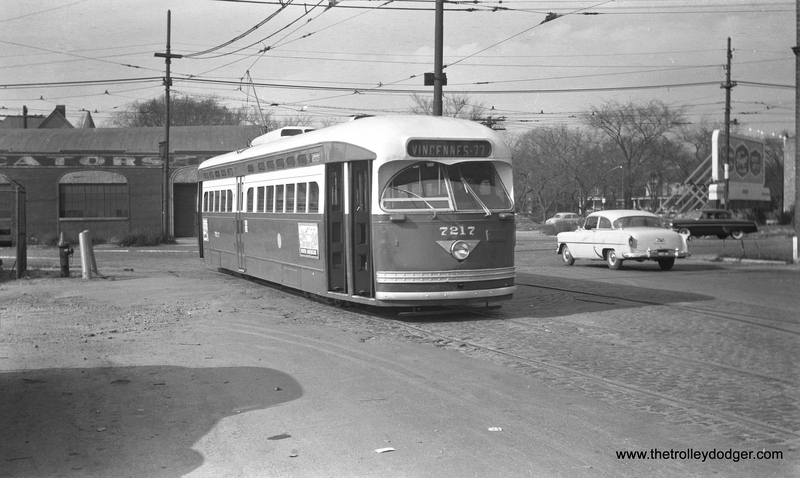 CTA 1760 at Cermak and Kenton, west end of route 21, on March 21, 1954. This was the city limits. 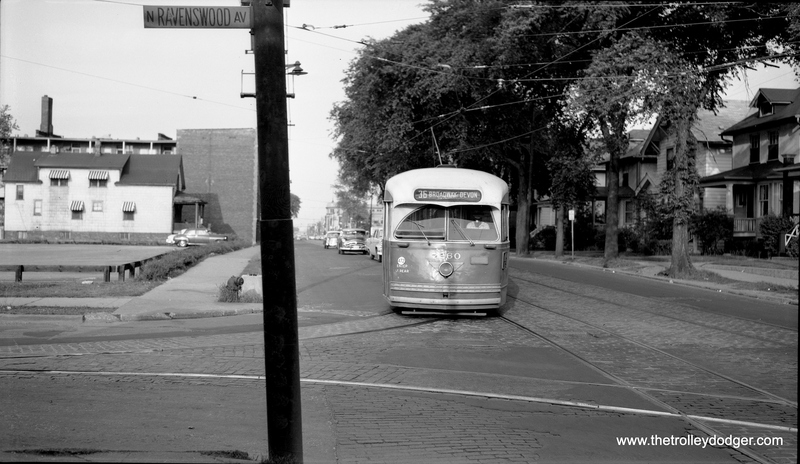 When the nearby Douglas Park “L” was cut back to 54th Avenue in 1952, CTA began running an “interurban” bus west of here. Bus route 21 now goes all the way to the North Riverside Mall, just west of Harlem Avenue. 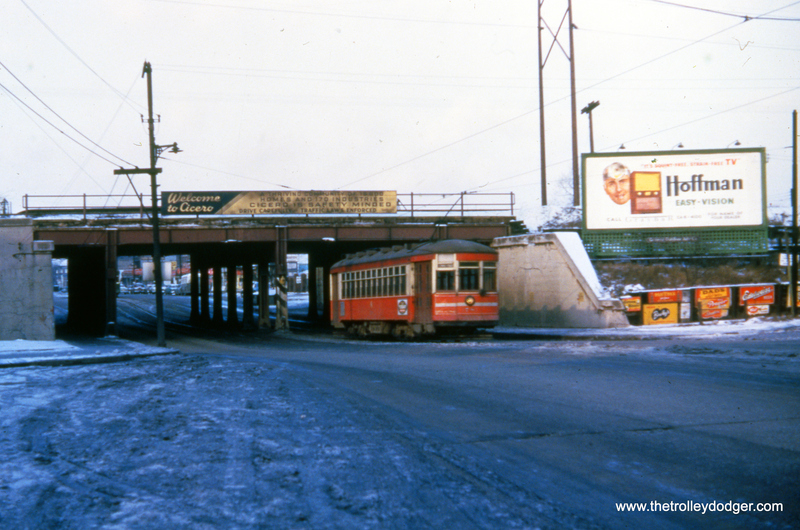 CTA 3153 is turning from Pine onto Lake Street in January 1952, crossing ground-level tracks of the Lake Street “L”. These were elevated onto the nearby embankment in 1962. 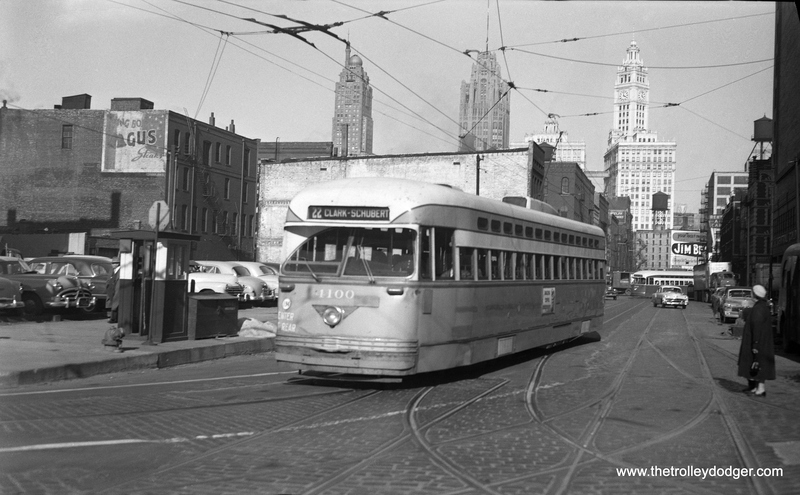 CTA 4317 on State Street near the Loop in March 1952. 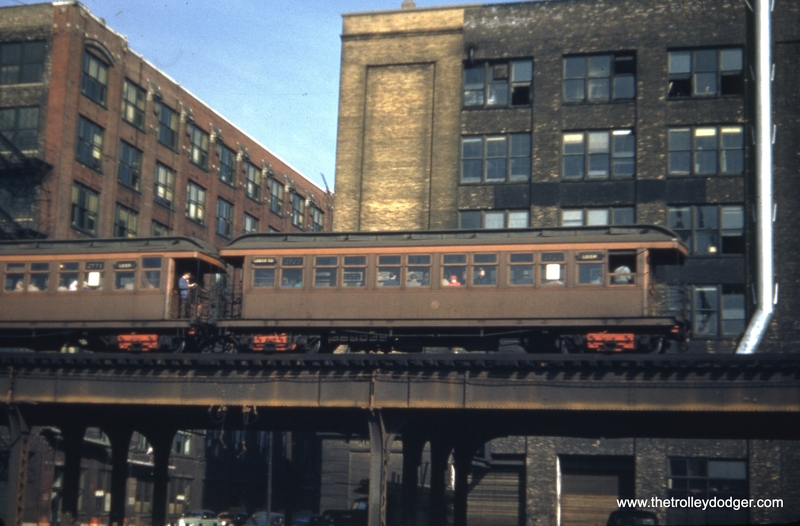 This is not a very sharp photograph, but CTA 4242, shown here in November 1950, may be on Halsted, having just crossed the Chicago River. 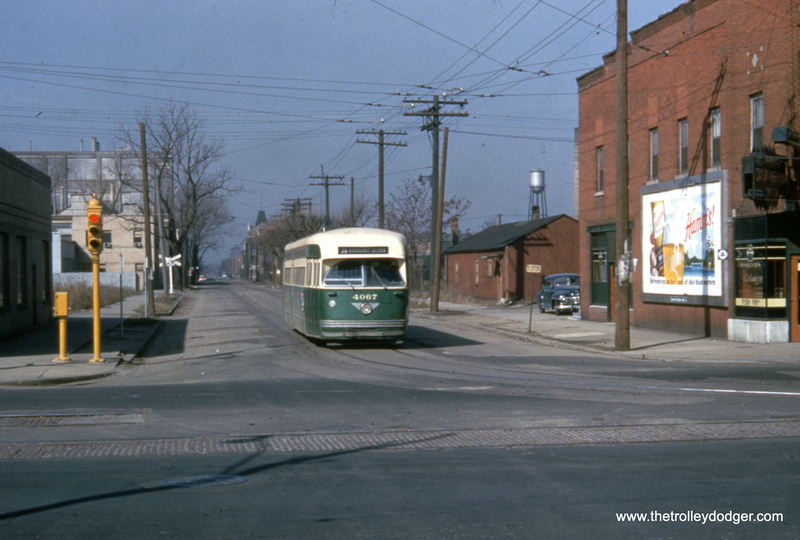 CTA 4392 is at the south end of route 36 on March 21, 1954, somewhere in the vicinity of 120th and Morgan. 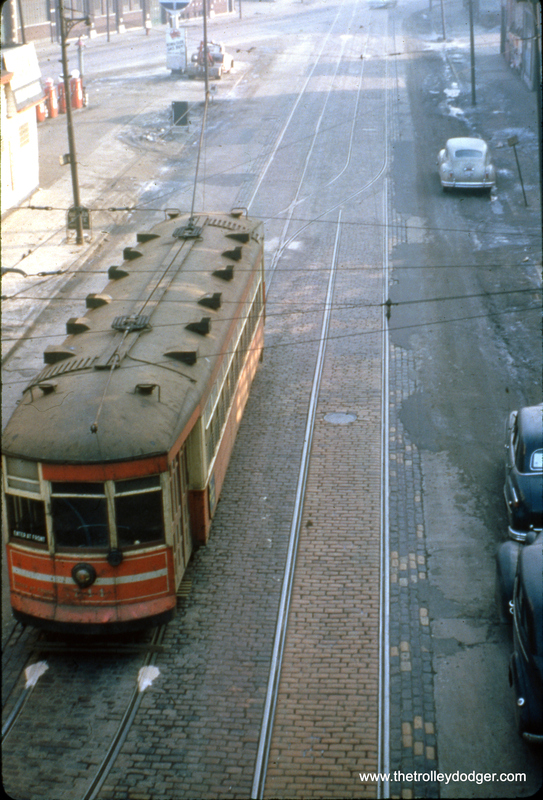 CTA had plans to build a new off-street loop for these cars at 115th and Michigan, which would have eliminated this portion of the route, but such was never built before streetcar service ended. 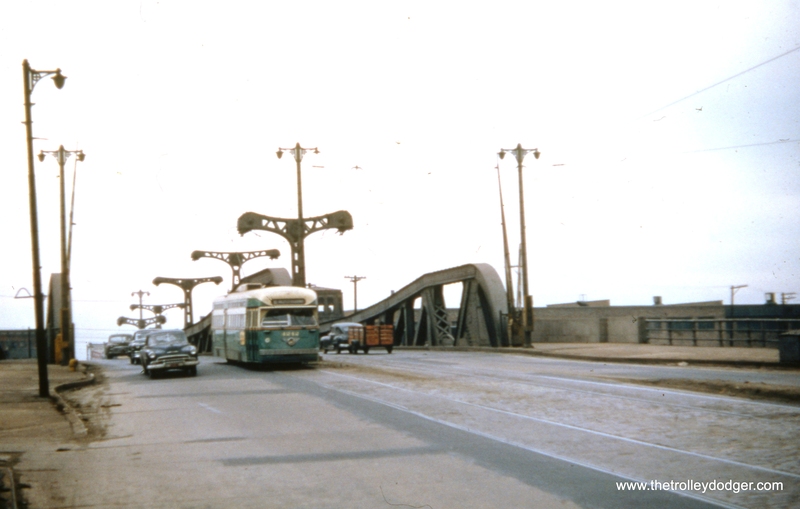 CTA 4067 at 120th and Halsted on March 21, 1954, near the south end of route 36. 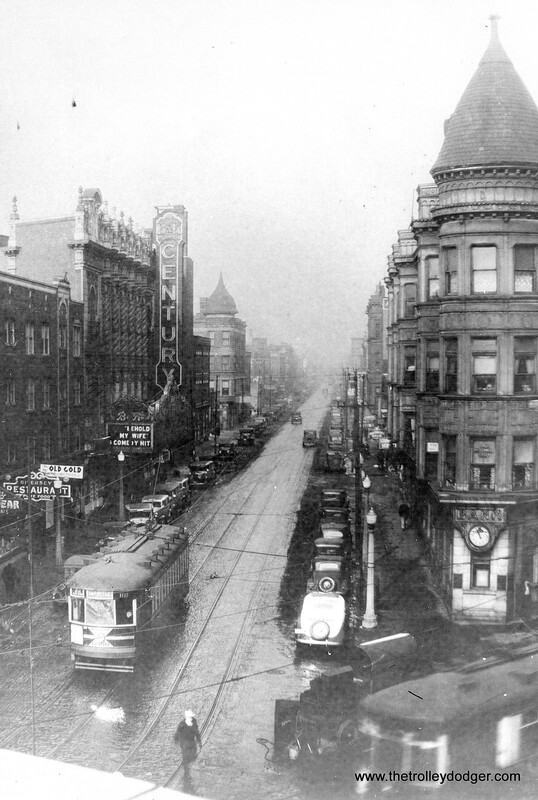 This was a tough one to figure out, but my best guess is we are on Halsted looking north just south of 119th. 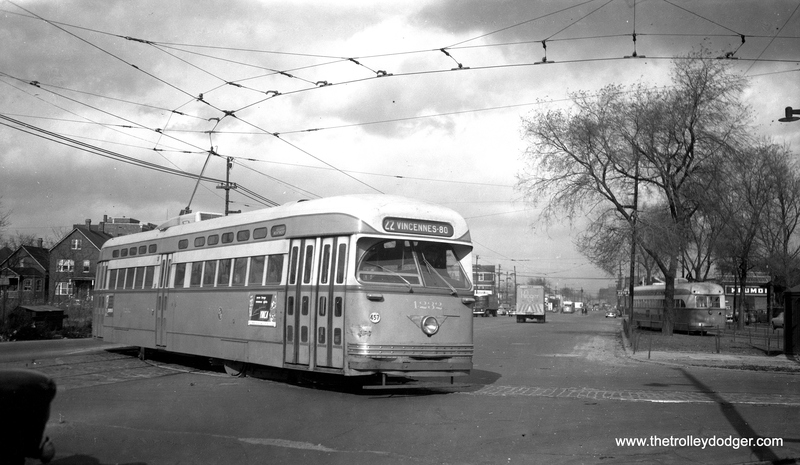 The route 36 PCC 7264 is turning east onto 119th on March 21, 1954, making a jog from 120th. Under the gas sign, you can just barely see a small part of the gateman’s tower at this location. Route 8 Halsted PCCs ony ran as far south as 79th. This is the view on 119th looking east at Hasted. This is shown in the top picture on page 292 of CERA Bulletin 146. The building at left is the same as in that earlier picture. 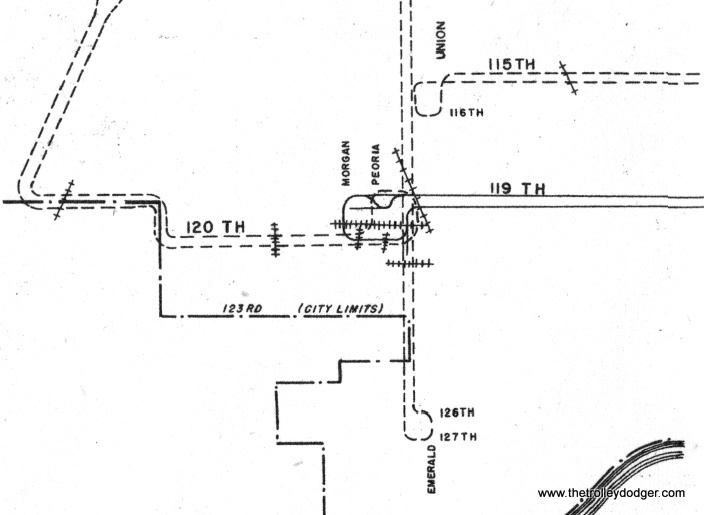 This enlargement from the 1952 CTA supervisor’s track map shows how route 36 streetcars turned around at 120th and Morgan and where they crossed various railroad tracks. The track at an angle was the old PRR “Panhandle” route that went between Chicago and Logansport, Indiana. It was abandoned in the Conrail days. 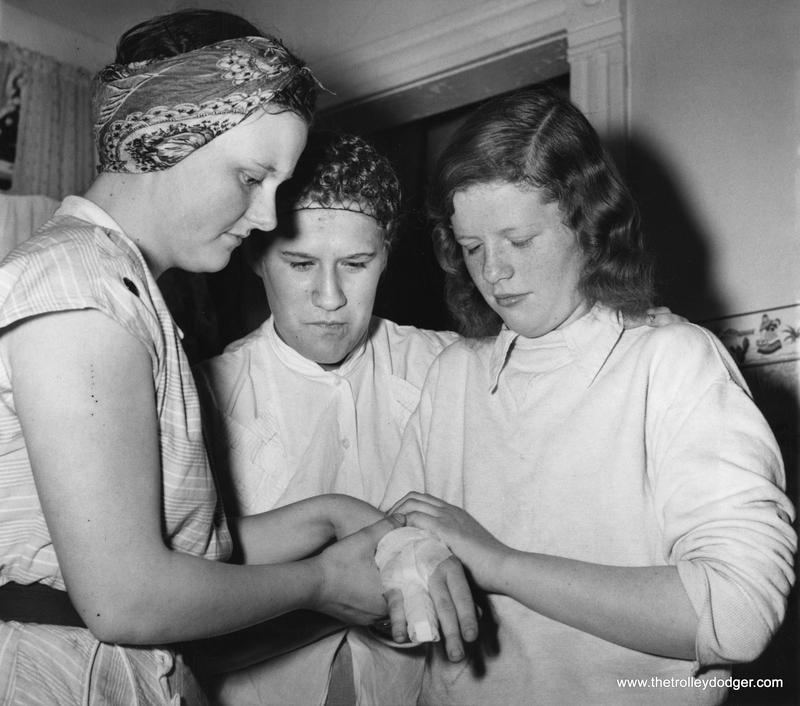 In the aftermath of the catastrophic collision between PCC 7078 and a gasoline truck on May 25, 1950, in which 33 people tragically lost their lives, we see one of the fortunate survivors, 14-year-old Beverly Clark. She was thrown to the floor by the collision, but managed to escape with relatively minor injuries. News reports indicated that 44 riders survived. 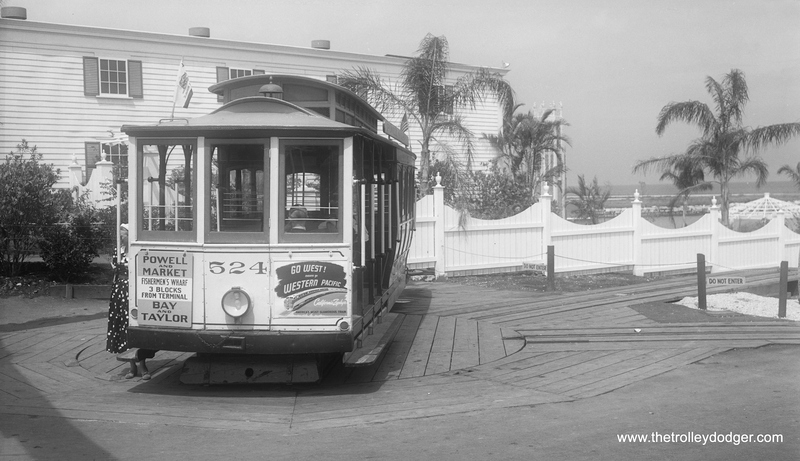 San Francisco cable car 524, shown here at the Chicago Railroad Fair in 1949, operated over a short section of track where the cable pulled it up an incline over a short distance. 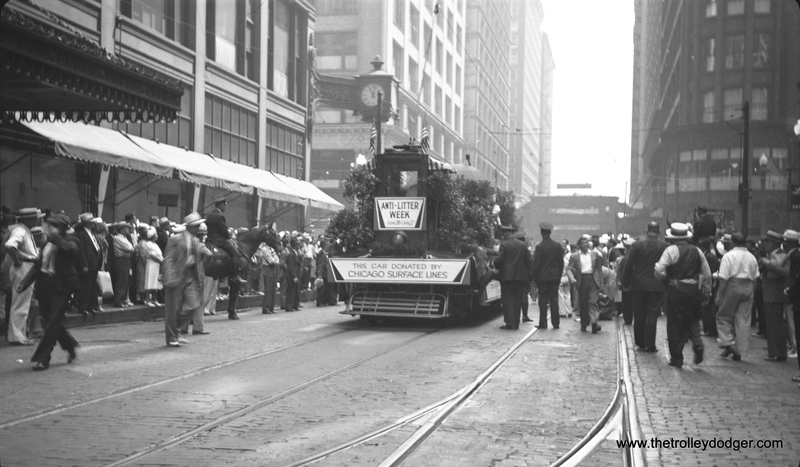 This made it the last cable car to operate in Chicago. 524 is back in San Francisco, and still operates there as far as I know. 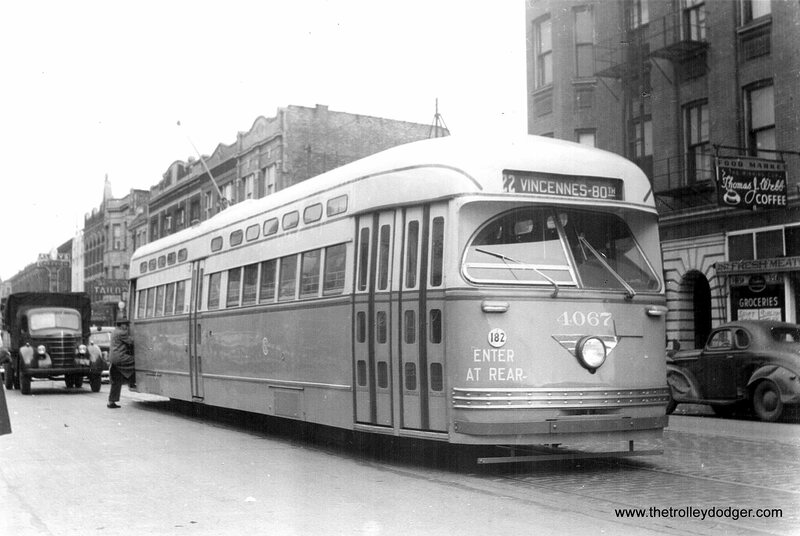 CTA Pullman 122, signed for route 53 Pulaski, on September 2, 1949. 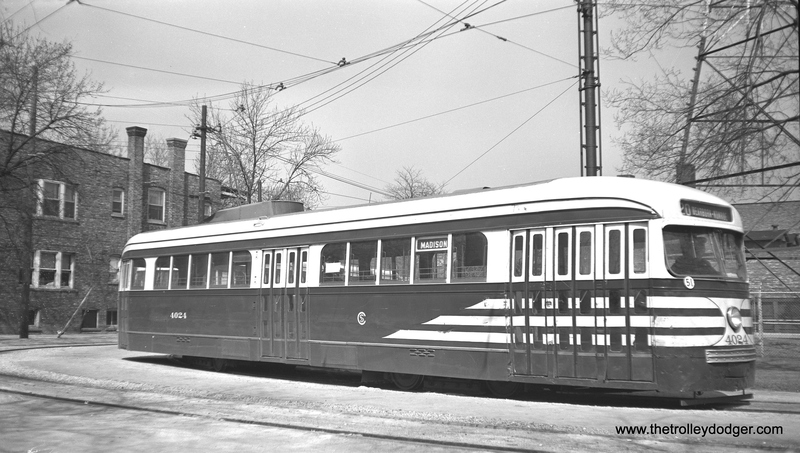 CTA salt car AA96 in the early 1950s. 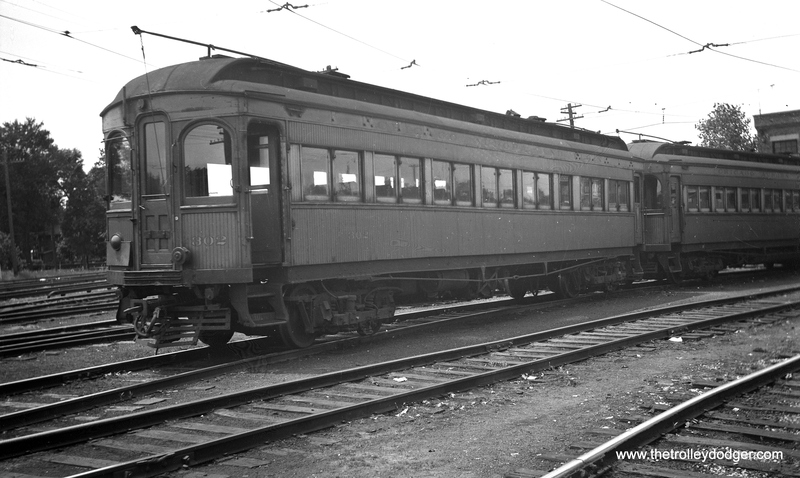 Formerly CSL 2844, this car had a scrap date of December 27, 1955. Here is an oddity. In this picture, CSL work car 106 has been decorated for Anti-Litter Week as part of a parade. 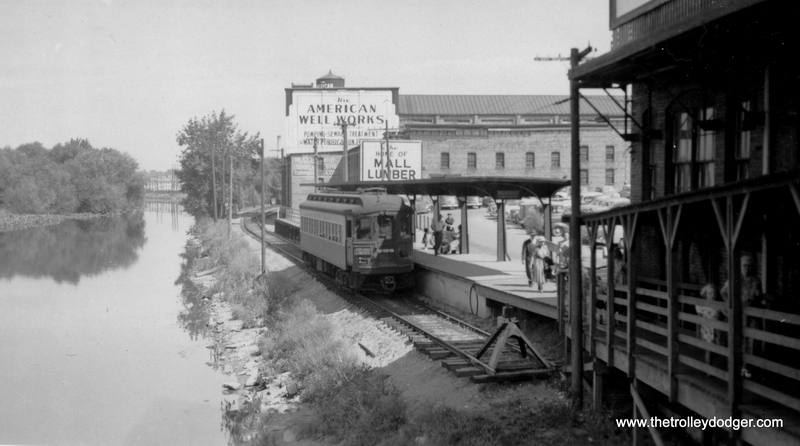 CSL Pullman 127 passes the old North Western Station on Madison on August 18, 1941, while a man in a straw hat wonders why anyone would want to take a picture of a streetcar. 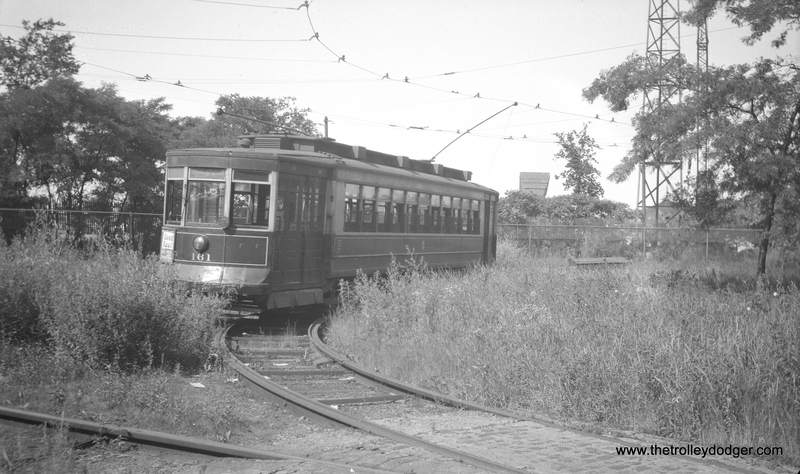 This July 1948 picture of CSL 161 shows it in the weeds at that portion of the Cermak line extended to the lakefront for the Chicago World’s Fair. This picture is a bit of a mystery. Although CSL 1899 says it is destined for 63rd and State, that is not this location, since we see the “L” in the background. Sandy Terman: “The photo of flexible 1899 I believe was taken in the lower yard north of west shops just north of Lake street.The trains above I think were actually Lake Street. 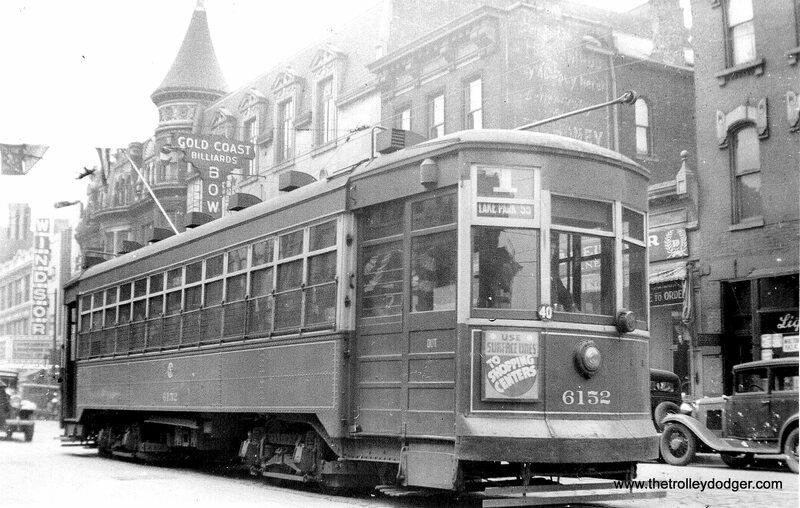 the 1899 may have been pulled out of service from the State-Lake route according to the destination sign.” That’s a pretty good theory, and backing it up, you can see trolley poles on some of the “L” cars in the picture. 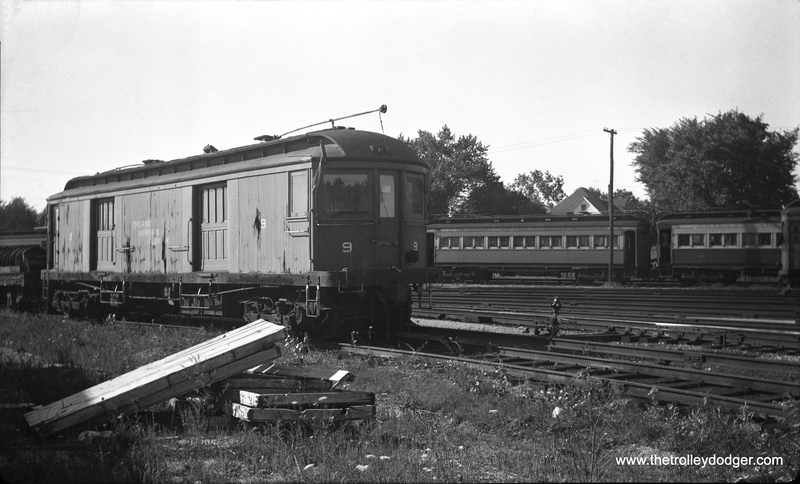 If Mr. Terman is right, those cars are being stored on a third track on the Lake line, which did not have a “proper” yard at the end of the line until after the 1962 elevation. 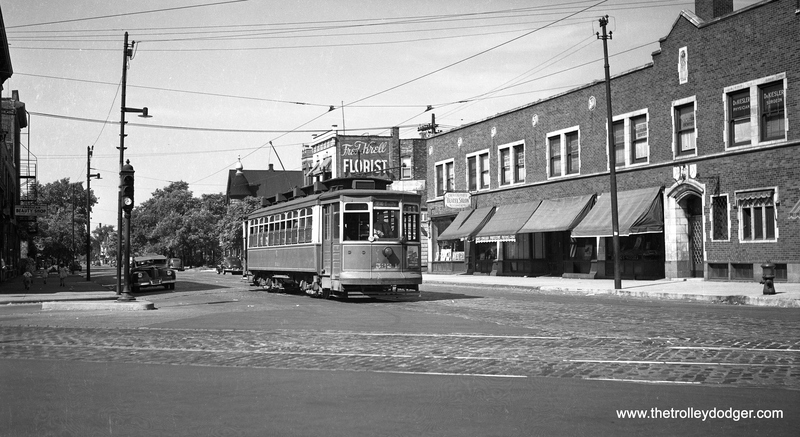 CTA 3226 at 71st and California in 1950. 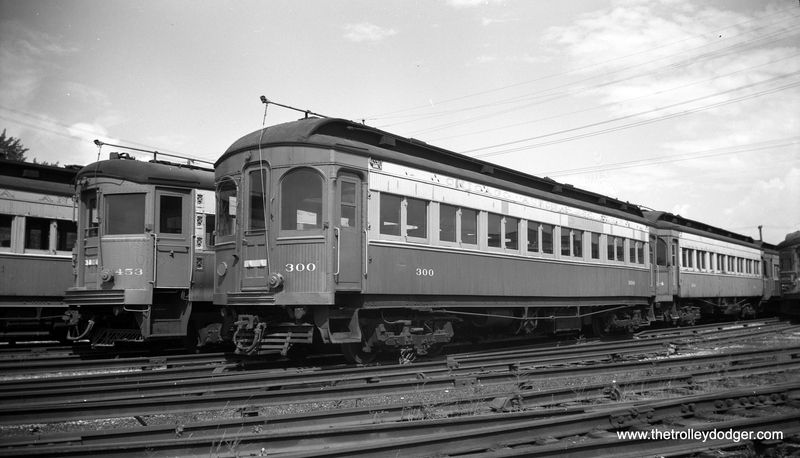 CTA work car W-204, described as a “two-cab flat,” in May 1950. CSL one-man car 3281 is at Division and Austin, west end of that line. 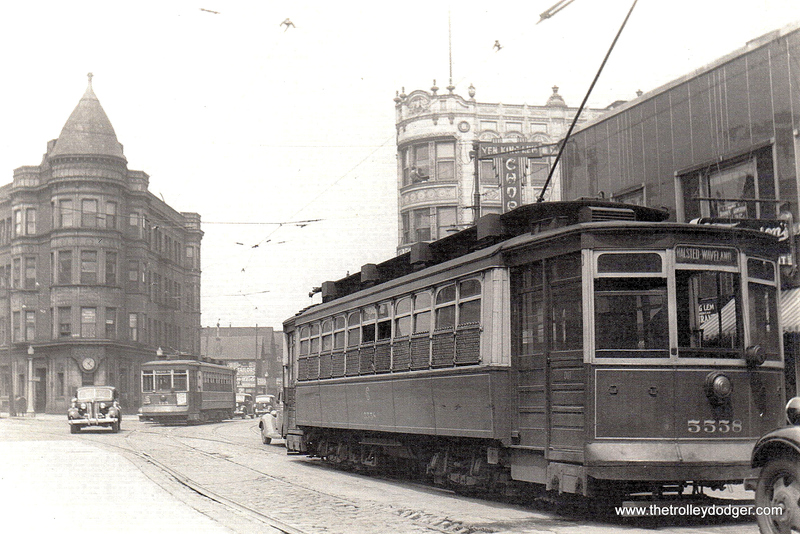 Before there were off-street turnback loops, double-ended streetcars typically stopped right in the middle of the street before going back the other way. Across Austin, that’s suburban Oak Park. CSL 1964 is at Chicago and Austin, west end of line, at the city limits. <img class="size-large wp-image-9206" src="https://thetrolleydodger.files.wordpress.com/2017/01/dave661.jpg?w=665" alt="We ran a similar picture as this in our most recent post, This one was taken shortly after that one, and shows CSL 3082 westbound on Randolph in the summer of 1938. 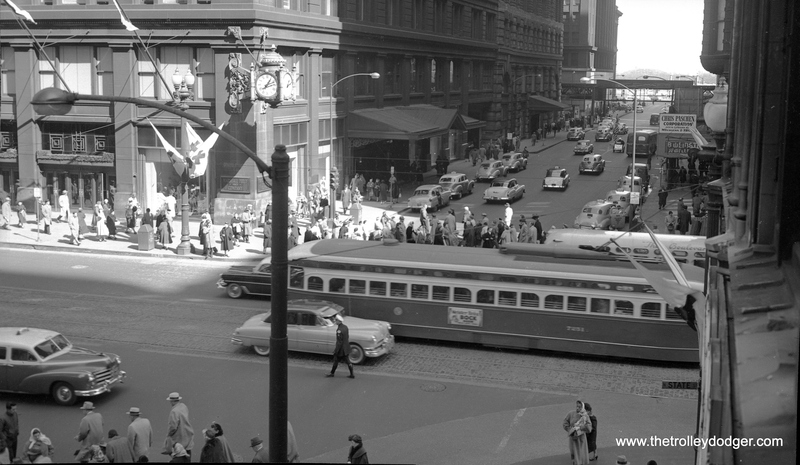 Holiday, starring Cary Grant and Katherine Hepburn, is playing at one of the many movie palaces the Loop once had.” width=”665″ height=”486″ /> We ran a similar picture as this in our most recent post, This one was taken shortly after that one, and shows CSL 3082 westbound on Randolph in the summer of 1938. 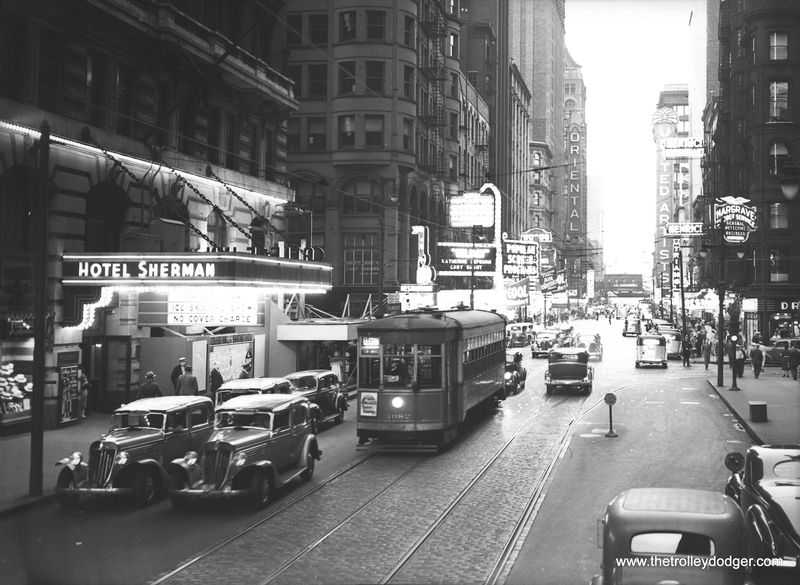 Holiday, starring Cary Grant and Katherine Hepburn, is playing at one of the many movie palaces the Loop once had. CTA 3200 heads east on the Roosevelt road extension over the IC tracks, which ran to the Field Museum and Soldier Field. 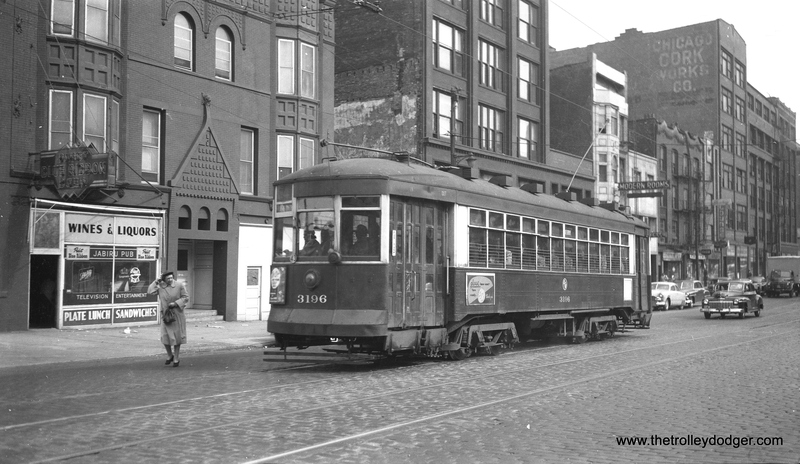 By this time, streetcar service on Roosevelt had been reduced to a shuttle operation between Wabash and the Museum Loop. This picture was taken in May 1952, and the shuttle was discontinued the following year. 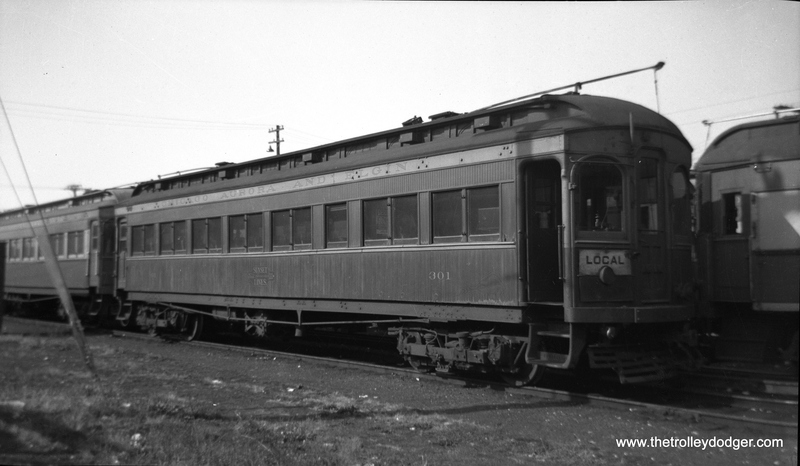 CSL 4024 at the Madison-Austin loop on October 14, 1946. Note the modified trolley shroud on this car. 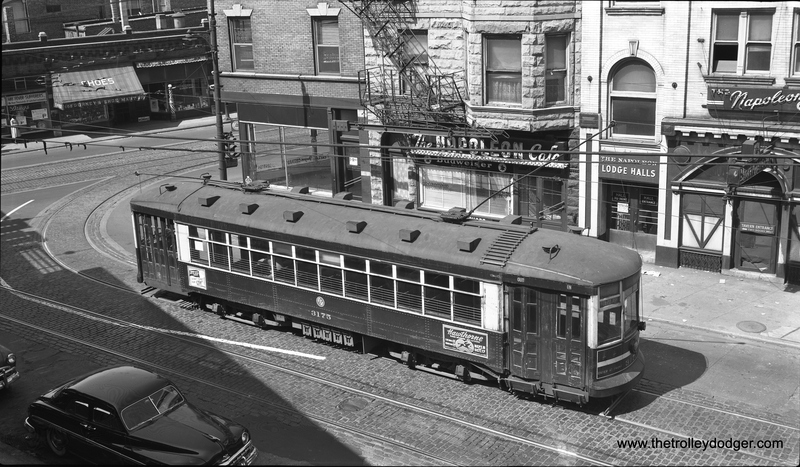 CTA 7251 at State and Washington in August 1948. That’s one of the iconic Marshall Field’s clocks at left. 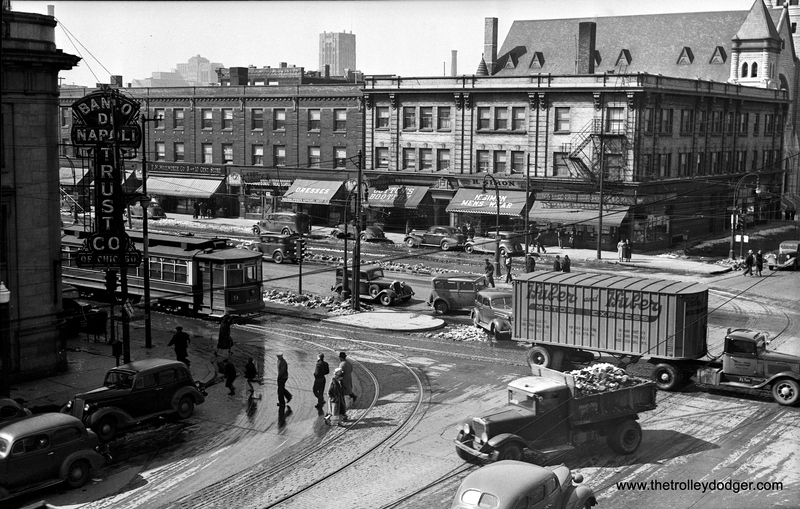 Clybourn (left) and Halsted (right) in 1938. There are no streetcars present, but plenty of tracks. 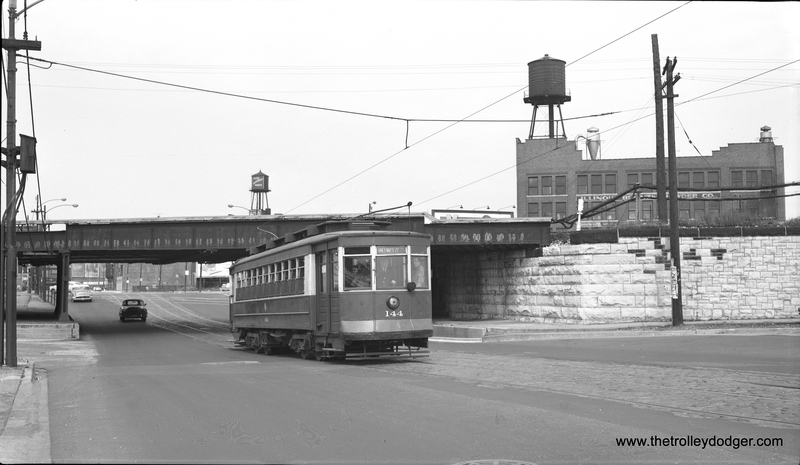 In the background, we see part of the Northside “L”, generally called the “triple curve.” The State Street subway had not yet been built when this picture was taken, but a station at North and Clybourn would eventually replace the one here on the “L”. 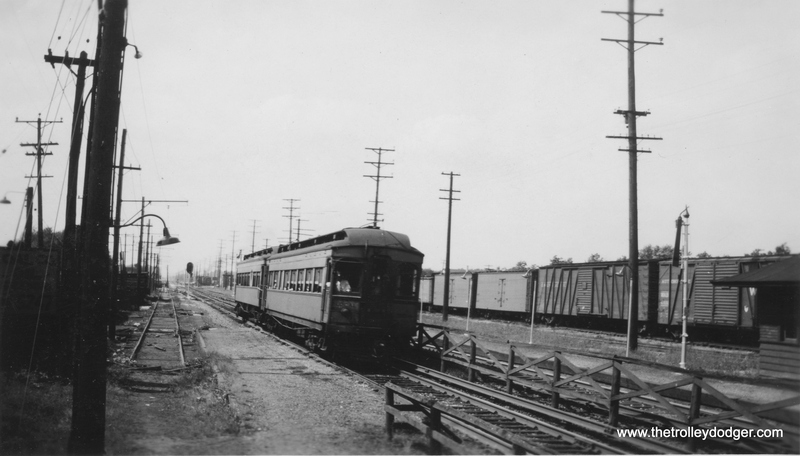 This section of line is still used today by Brown and Purple Line trains, and has not been straightened out. CTA Pullman 996 at the 69th and Ashland Station (car barn). 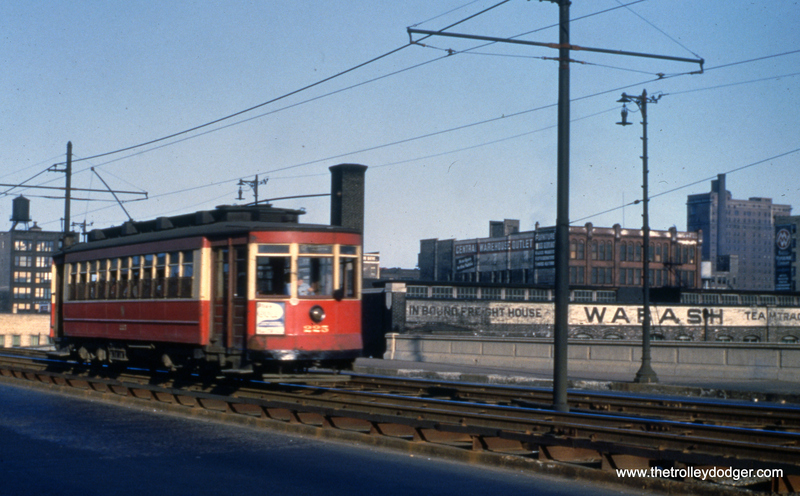 CTA 3196 at Wabash and Roosevelt in March 1953. 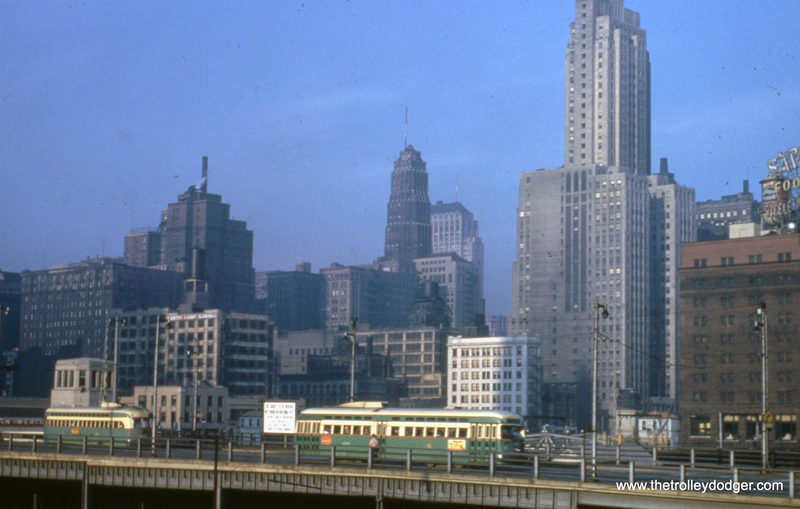 CTA PCC 4100, built by Pullman, is turning from Kinzie onto Clark in November 1953, with Tribune Tower and the Wrigley Building at rear. 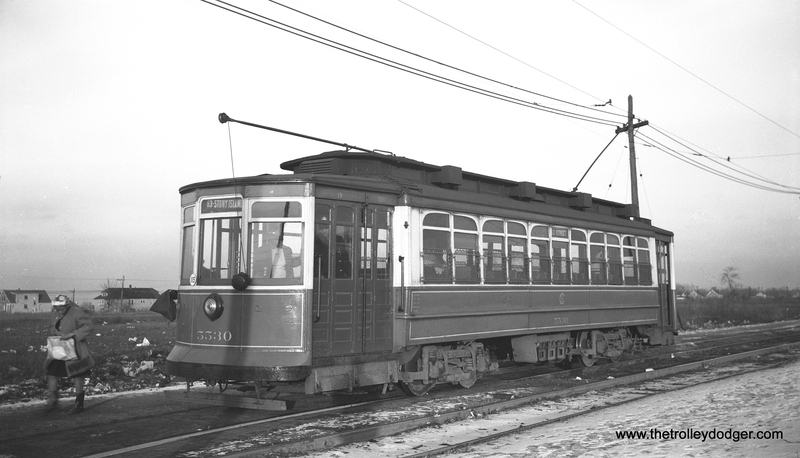 CTA 7217 at 77th and Vincennes in February 1953. We have run this picture before (in More Chicago PCC Photos – Part Five, October 28, 2015), but now we own the original negative. 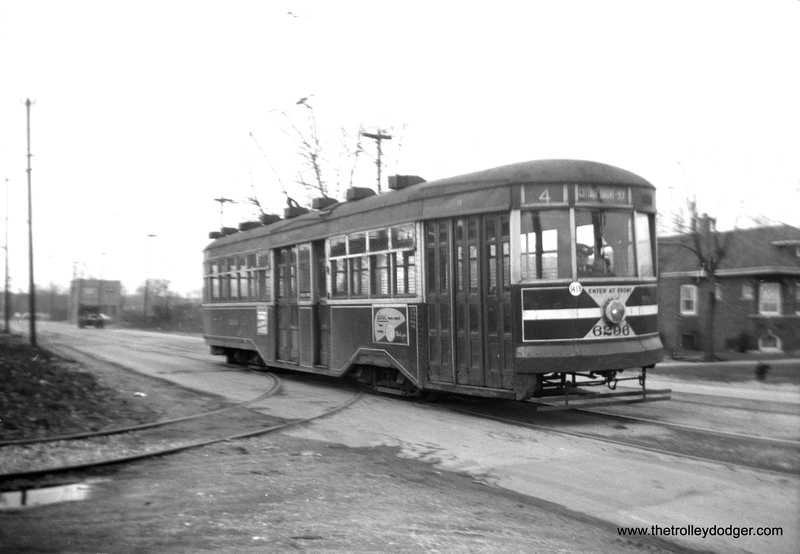 One of our readers thinks that CTA 7217 is likely eastbound on 78th pulling off of Vincennes Avenue. 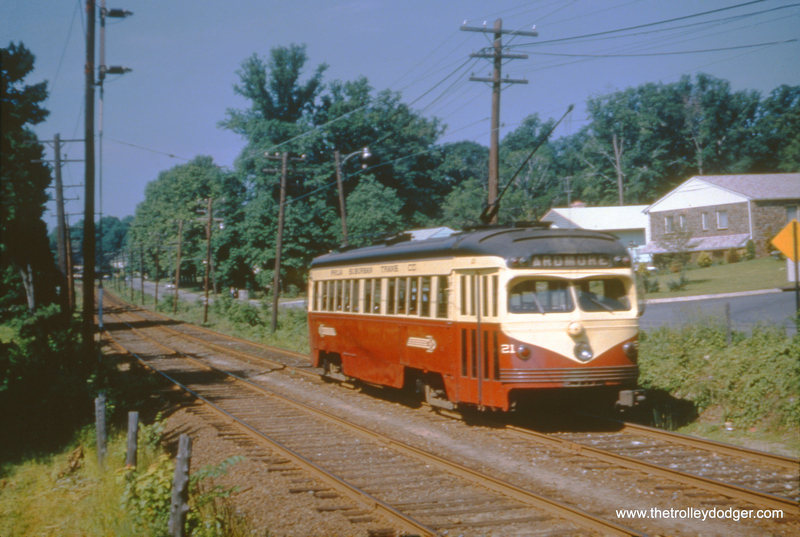 They continue, “Since the sun is obviously in the east, this appears to be a route 22 pull-in after the AM rush.” The date given for that other version of the picture was December 1953, and it was credited to Harold A. Smith. You would be forgiven for thinking that this photo of CSL Brill car 5986 was taken on State. In actuality, this is Lake and Austin, with the old Park Theater in the background. This was the west end of the line, at the city limits. This car was on the Lake-State through route 16. 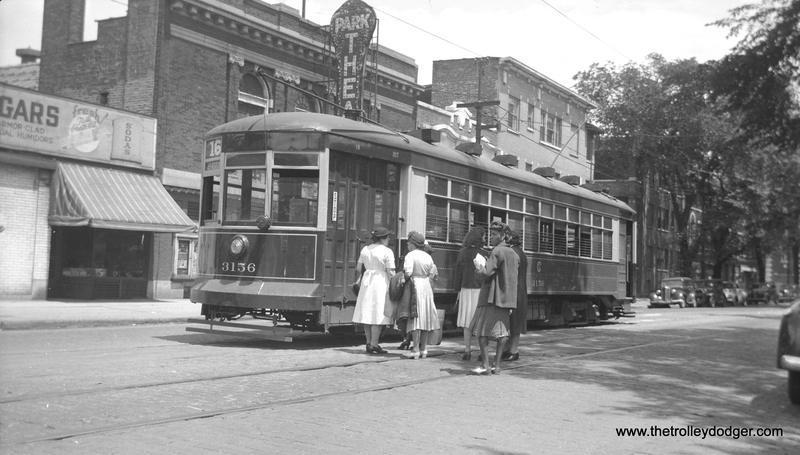 The through route was discontinued in 1946, and streetcar service on Lake in 1954. This picture dates to the 1930s. 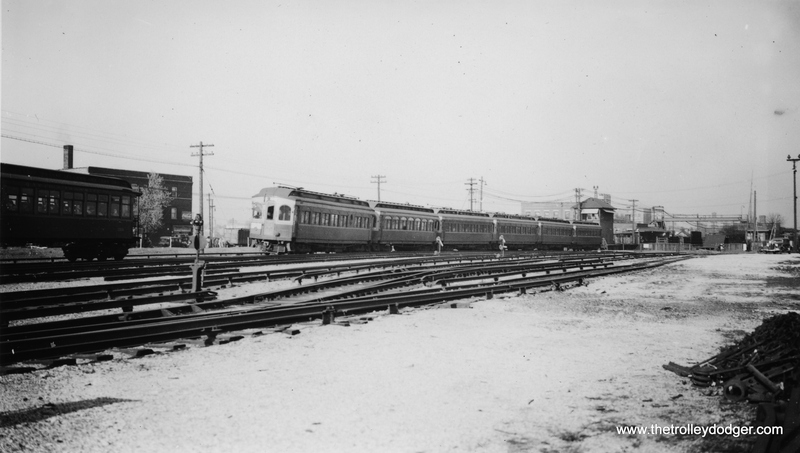 Riders wait to board the rear of CSL 3156 at Lake and Austin in the late 1930s. This car was on Through Route 16 (State-Lake). That is the Park Theater behind the car. It closed sometime around 1952. This is our 173rd post, and we are gradually creating a body of work and an online resource for the benefit of all railfans, everywhere. To date, we have received over 241,000 page views, for which we are very grateful. We finished our second year with 127,545 page views, and increase of more than 20,000 (18%) over 2015. There were 35,315 individual visitors, up from 30,743 the year before. Amazingly, this was done with fewer posts (63 vs. 108). This means the average number of page views per post more than doubled, to just over 2000. What does that tell us? To me, it shows there is an avid and growing audience for this type of material, if you know how to connect with them. To successfully reach this audience takes a lot of work. As 2017 begins, we make a renewed commitment to keep this going and do our very best. We are committed to excellence. But of course, we are not really doing this alone, because all of you are an essential part of our success. As we have shared our material and information with our readers, you in turn have shared more and more with us. To present this kind of original research does cost money, however. Right now, we are less than 30 days away from the expiration of our WordPress subscription, which costs $300 per year. Yes, $300 per year is a lot of money, but this includes not only an unlimited amount of online storage space for the more than 22gb of image files we have posted, but our domain registration as well. $300 per year works out to about 82 cents per day during the course of one year, and that is for all our more than 35,000 readers. Of course, the great majority of people pay nothing, and we want to do our best to keep this site free of annoying third-party advertising and such. Last year, our readers generously paid for half of the $300 subscription amount. Every dollar that you contribute is one more dollar that we will have available for our original research. Help us continue to provide uninterrupted service. Your help is greatly appreciated as we look forward to another successful year. 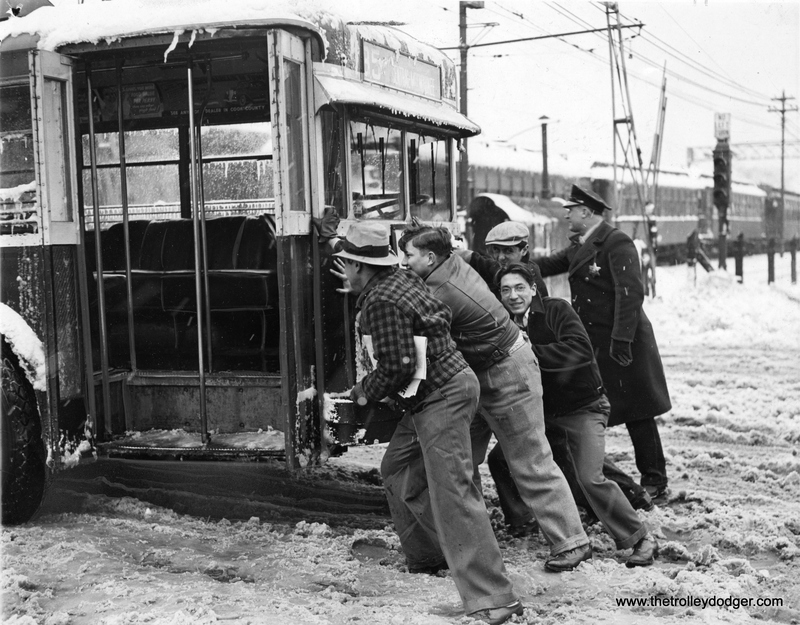 Here are more great classic photos for your enjoyment. PS- The new Bob Selle photos have been added to our post Love For Selle (June 8, 2016). 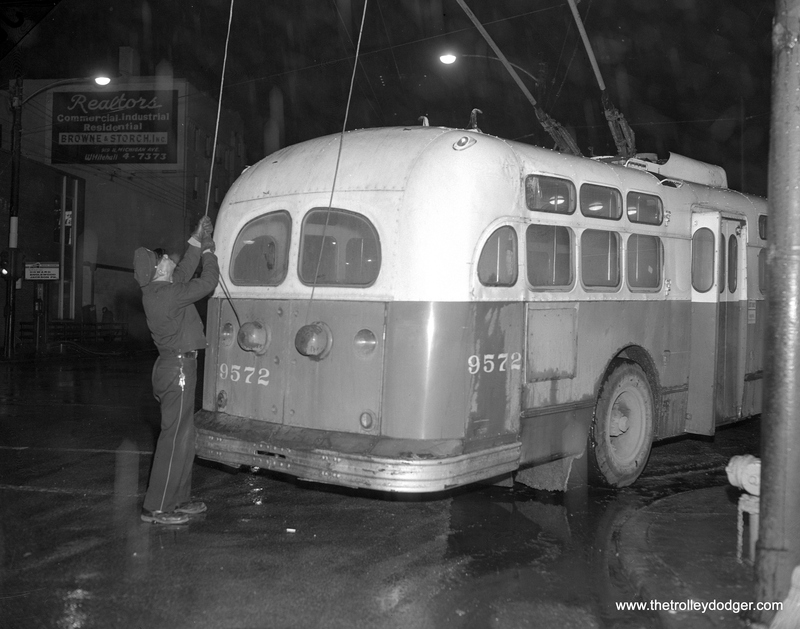 On January 23, 1965, the operator of CTA Marmon trolley bus 9572 has to get out at Grand and State and put the poles back on the wires. 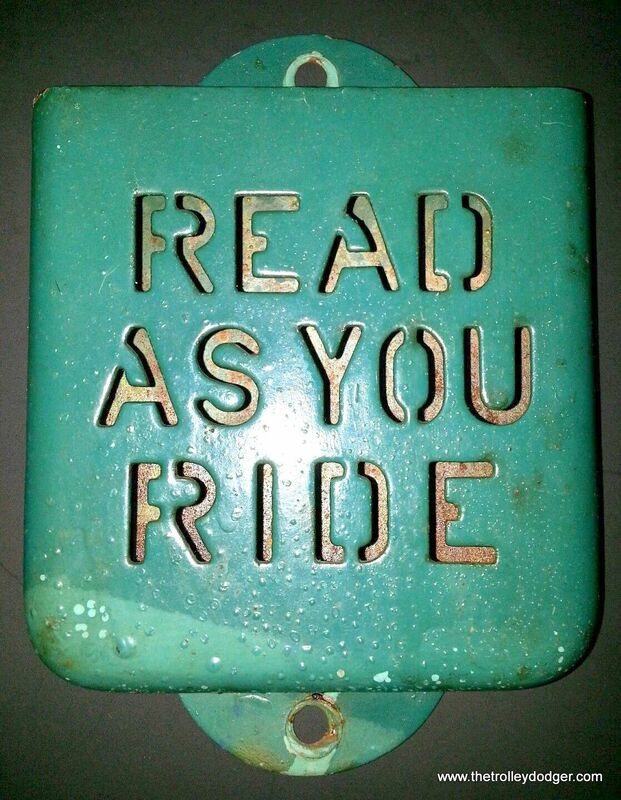 This was an occasional occurrence that CTA riders of a certain age will probably remember. 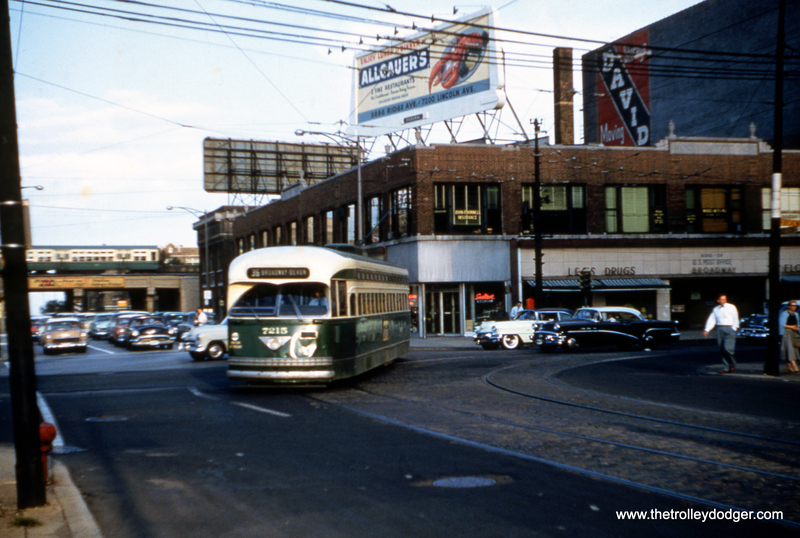 CTA 7260 is turning from westbound Devon onto northbound Ravenswood in the mid-1950s. An overview of the Fifth-Pulaski-Harrison area as it appears today. When the Congress (now Eisenhower) expressway was built, Fifth Avenue was cut off at this point just out of the right of the picture. 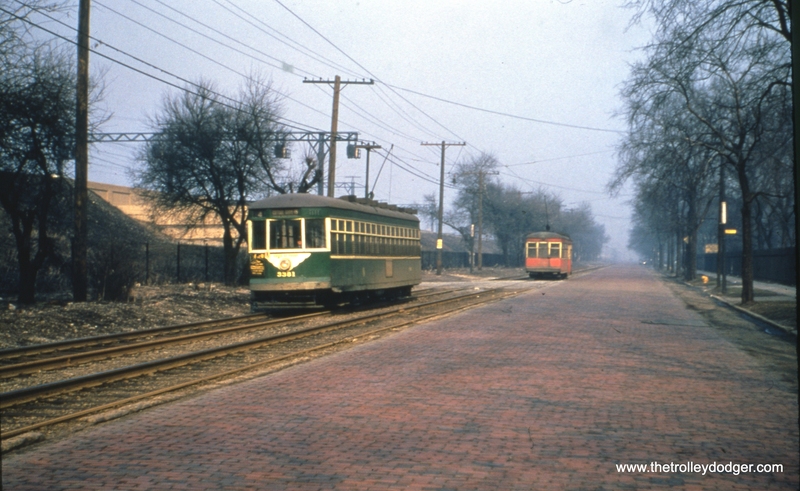 The Garfield Park “L”, which ran east and west at this point, was replaced by the Congress median rapid transit line in 1958. 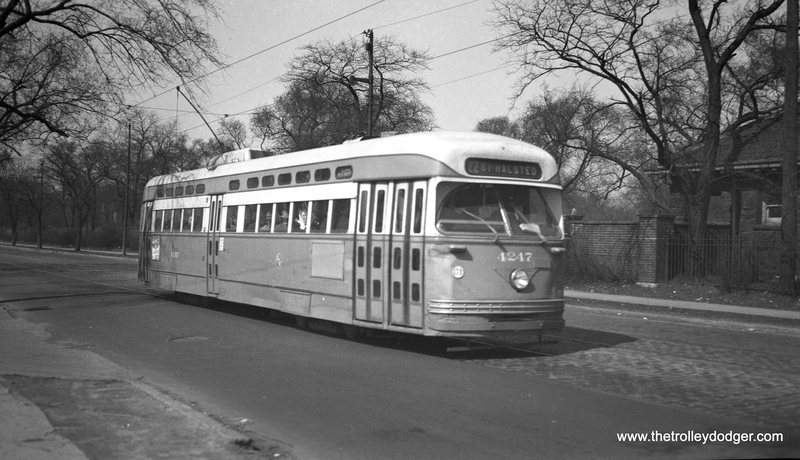 CTA 4247 is southbound at Clark just north of Irving Park in March 1953. Clark just north of Irving today. The building at right, shown in the 1953 photo, is still there. 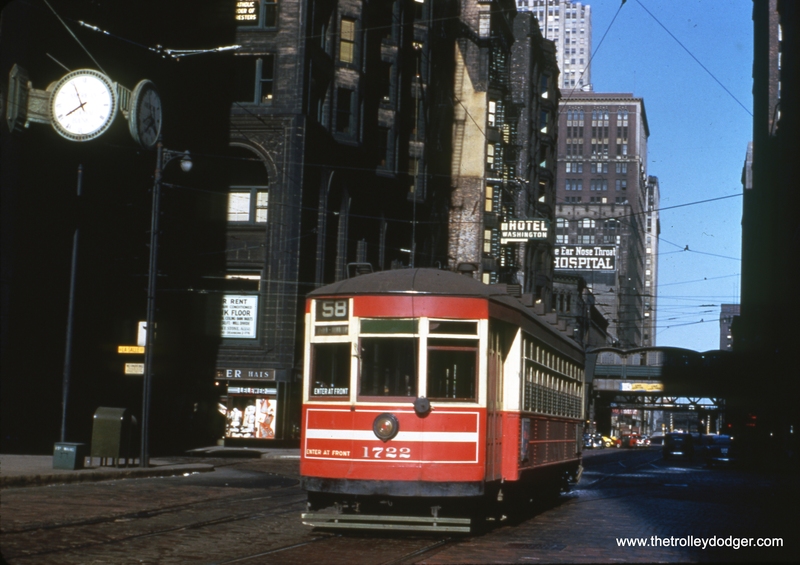 CTA 4297 at Clark and Madison in the early 1950s. The PCC is on Clark. This must be winter, as some women are wearing fur coats. Back then, a fur coat was a real status symbol, mink especially. Clark was still a two-way street at this point. 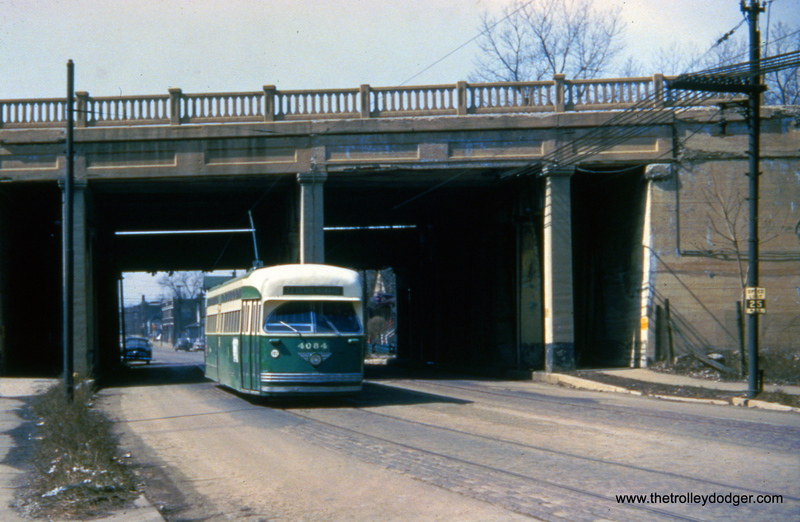 In the early 1950s, it was converted to one-way southbound, and Dearborn to northbound. Clark and Madison today, looking north. 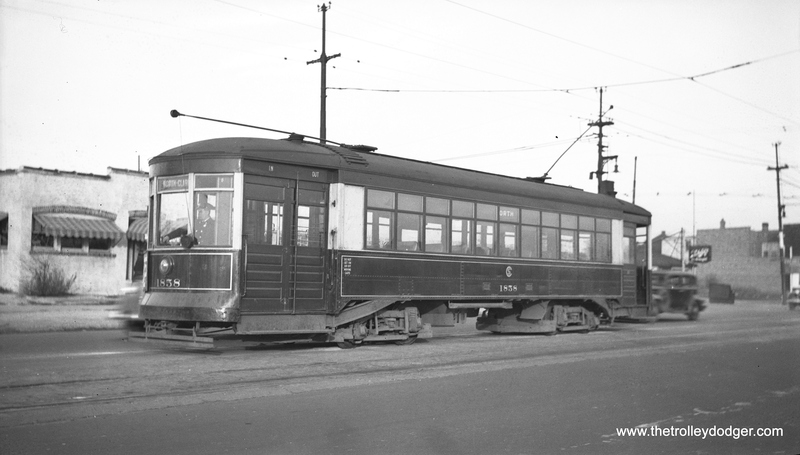 CTA Sedan (Peter Witt) 6296 at Cottage Grove and 93rd on December 10, 1949. This was a short turn– the usual end of route 4 was at 115th. 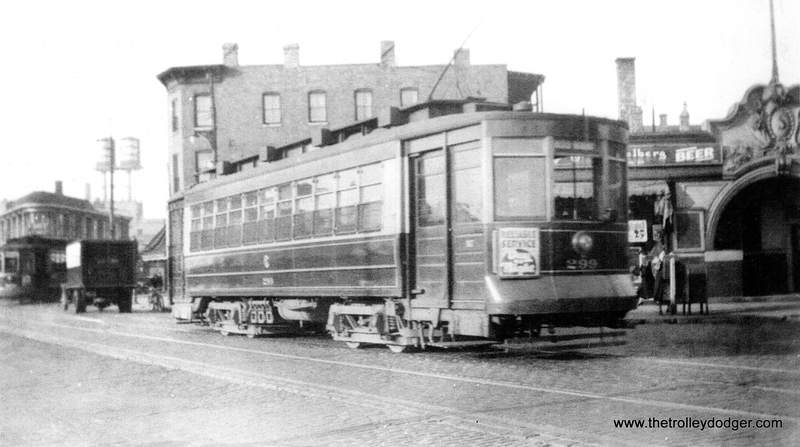 CSL 5639 on the Stony Island route, May 17, 1938. 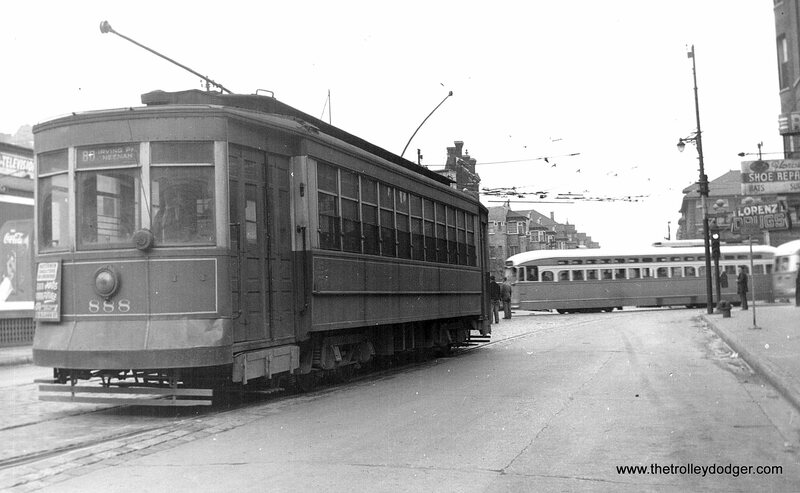 CSL 5324 is a southbound Ashland car on Southport at Lincoln on August 17, 1947. The building at right was a funeral home. 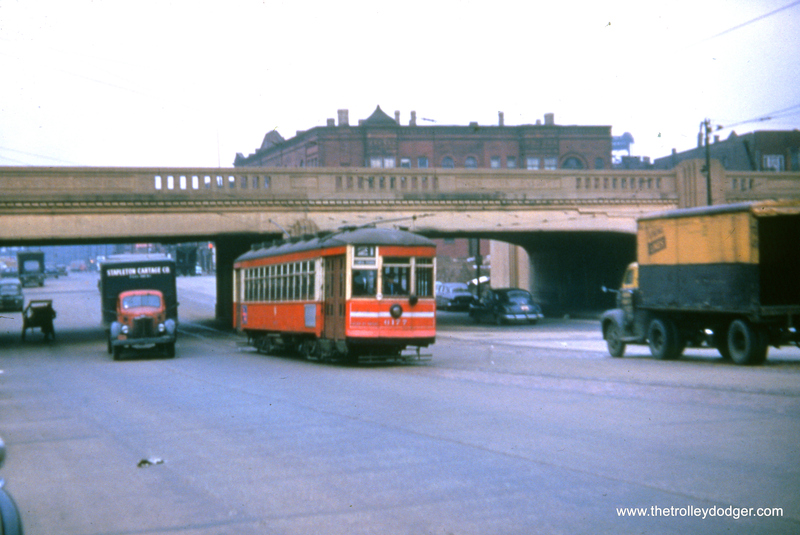 CTA 4283 is southbound on Halsted at Cermak (22nd Street) in May 1954. Halsted and Cermak today. We are looking north. 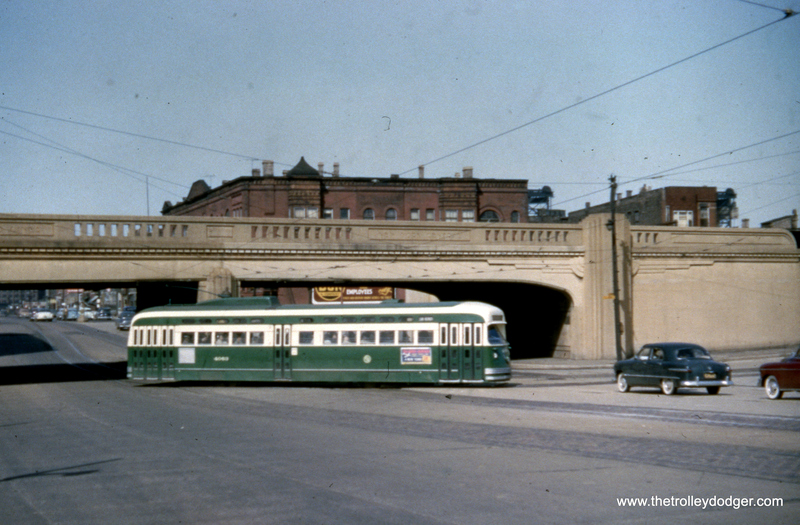 Here, CTA 4232 is entering the loop at 80th and Vincennes in May 1953. 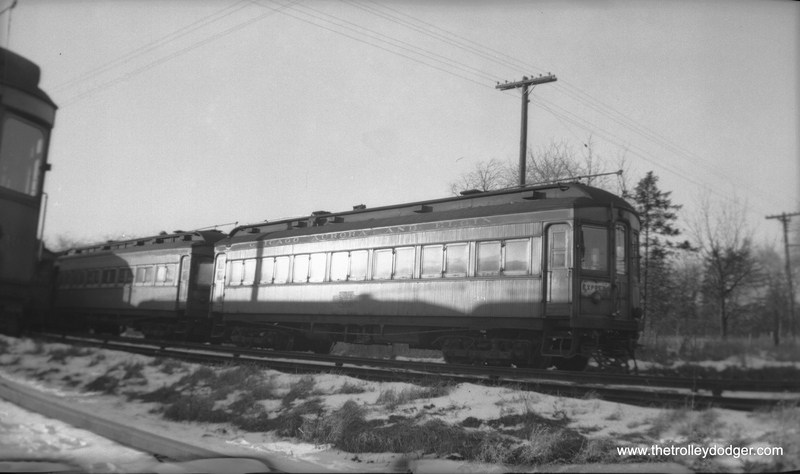 CSL 5530 at 63rd Pace and Oak Park Avenue in December 1946. 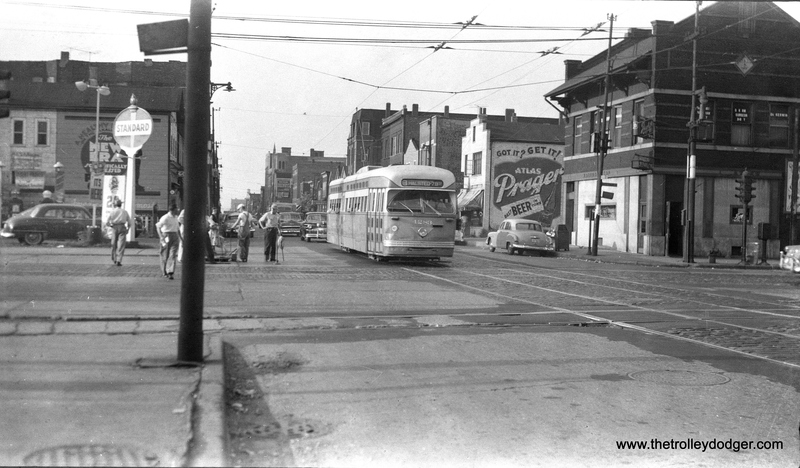 This was the west end of route 63 before PCCs took over the line in 1948. 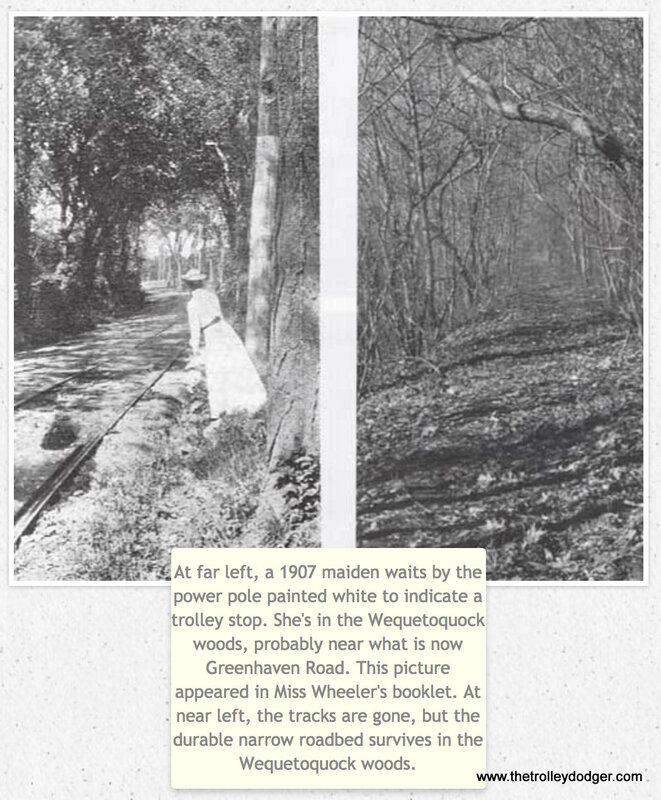 At that point, a turnback loop was built a half mile east of here at Narragansett. As you can see, the area was largely undeveloped at this point, but you could transfer here for service going farther west. 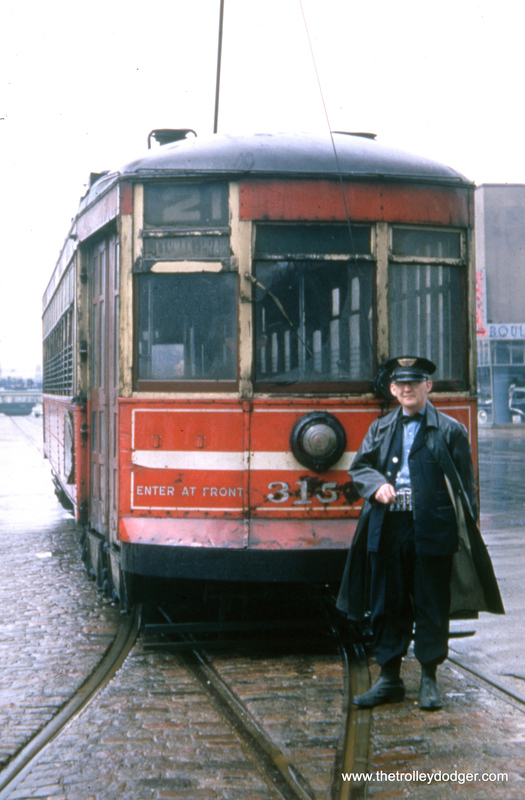 The motorman of CTA 4051 poses with the prewar PCC at 63rd and Narragansett on May 5, 1950. This was the west end of route 63. 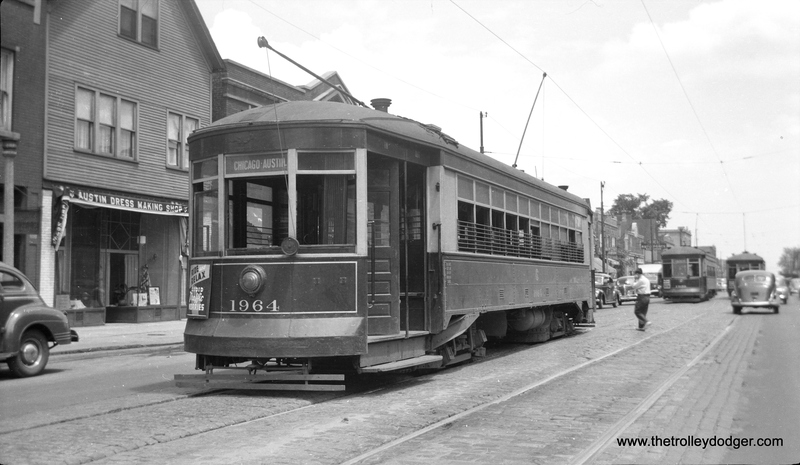 CSL 1858 on North Avenue on July 3, 1940. Michael D. Franklin writes: “There’s enough here to say that this is North & Narragansett. 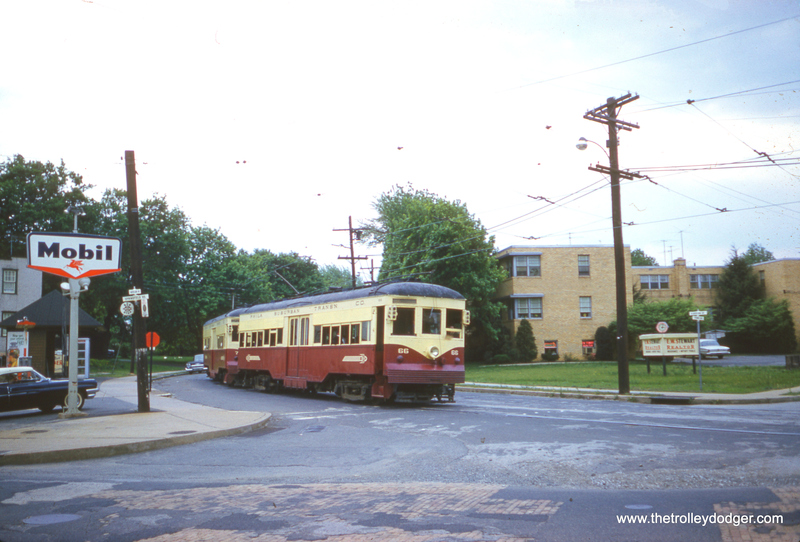 The trolley bus wires are above the building to the right and angled onto Narragansett. 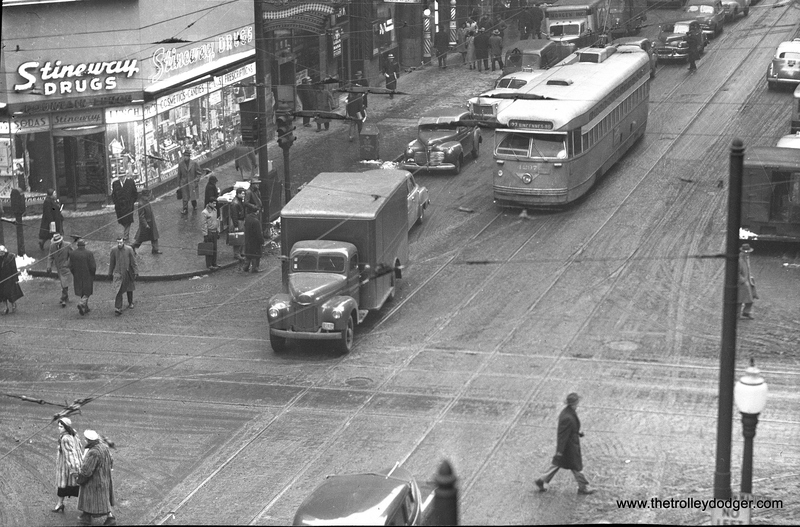 The bus would have turned into the alley, gone around the bar with (Schlitz sign) and then make a left back onto North Ave heading east. Historical Aerials confirms all of this.” The North Avenue cars turned back on the west side of Narragansett. 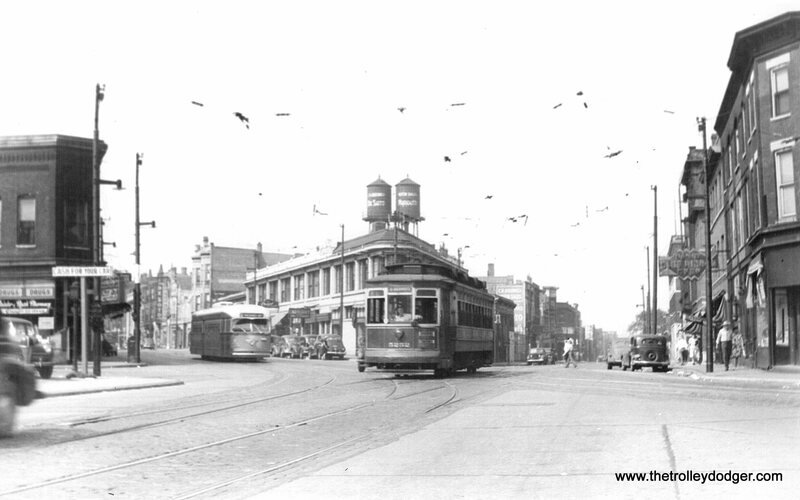 Between Narragansett and Cicero Avenue, there was two miles of shared wire between streetcars and trolley buses, unusual in Chicago. 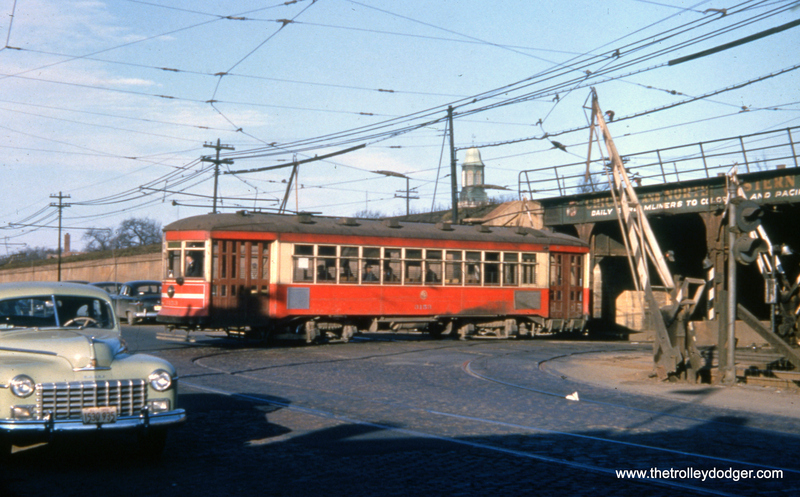 That was to permit Narragansett trolley buses access to the garage at North and Cicero. CSL 3010 is westbound on Randolph in Chicago’s Loop. 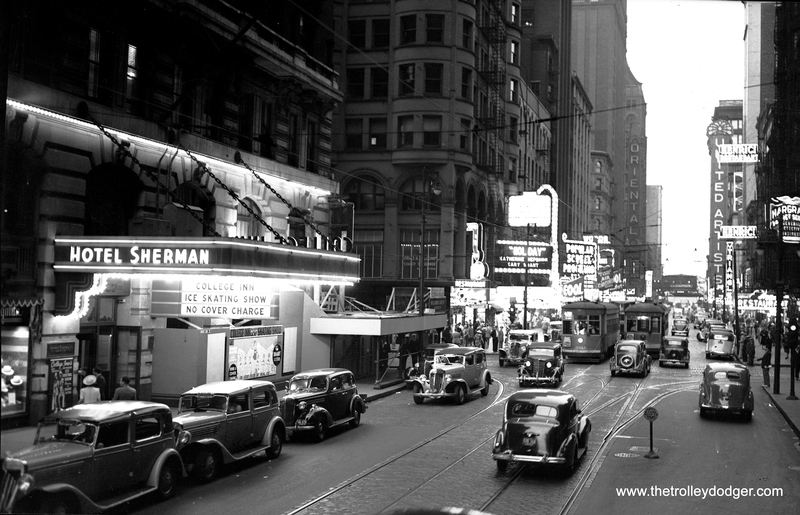 The film Holiday, starring Katherine Hepburn and Cary Grant, is on one of the theater marquees, which dates this picture to 1938. 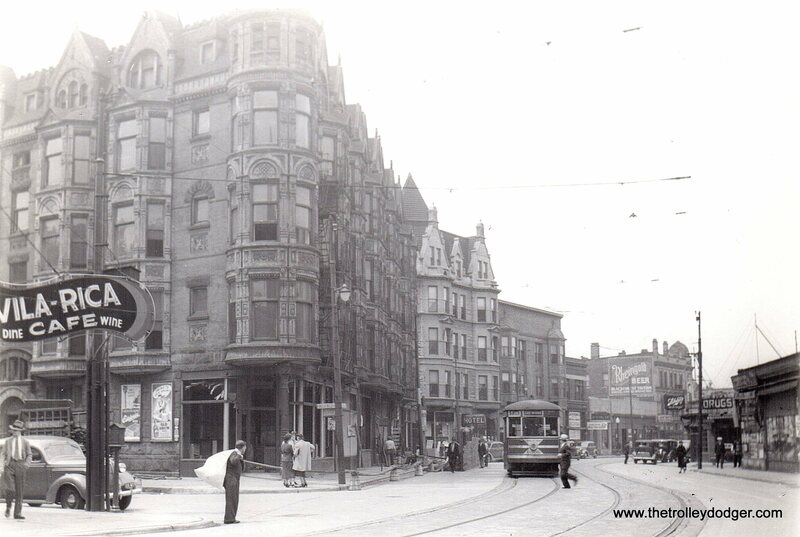 Besides the Hotel Sherman, we can see the Oriental, United Artists, and Woods theaters, plus Henrici’s restaurant. CTA 3381 is one of the few Sedans that got repainted green. This is on Cottage Grove, probably near 103rd. 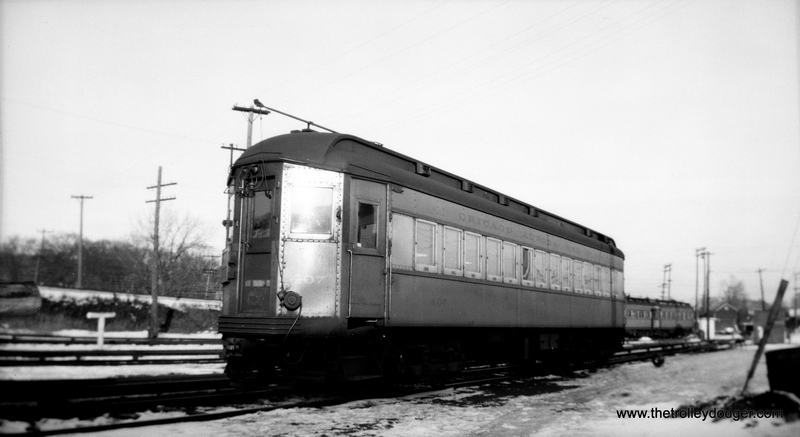 This picture shows a Logan Square train on the Met main line at Peoria, prior to the February 1951 opening of the Dearborn-Milwaukee subway. The same location today. The Met “L”, at this point, ran just to the north of the expressway footprint. Clark and Belmont today, looking north. This is our 172nd post, and we are gradually creating a body of work and an online resource for the benefit of all railfans, everywhere. To date, we have received over 232,000 page views, for which we are very grateful.